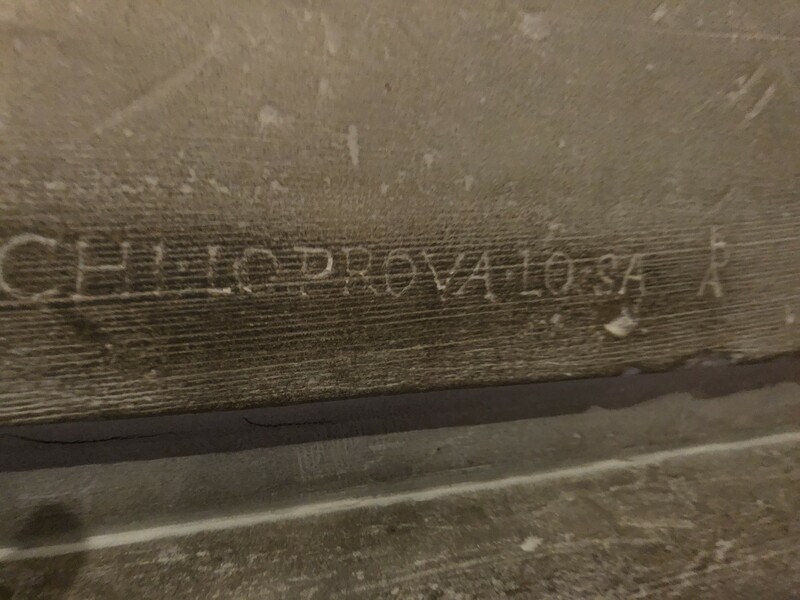 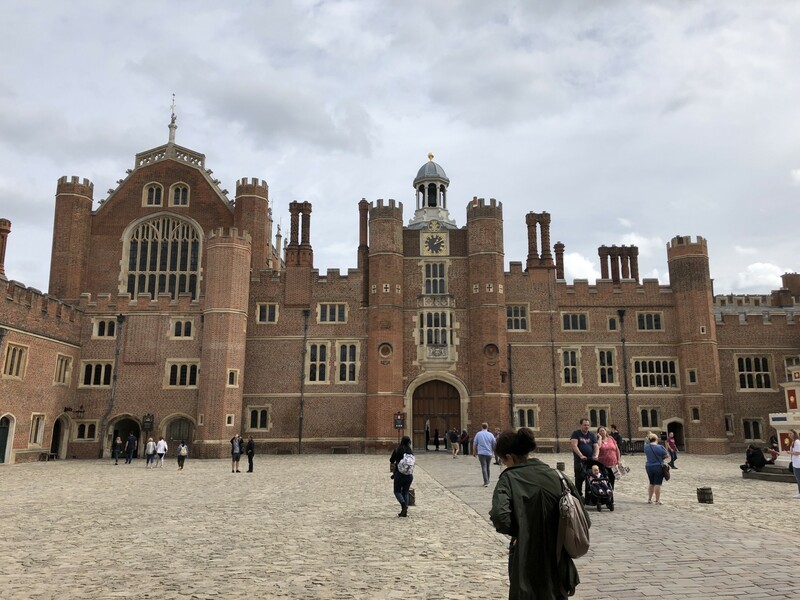 I went to Hampton Court Palace as a tourist, wanting to keep an eye out for graffiti but not having planned this visit as a graffiti-hunting trip. 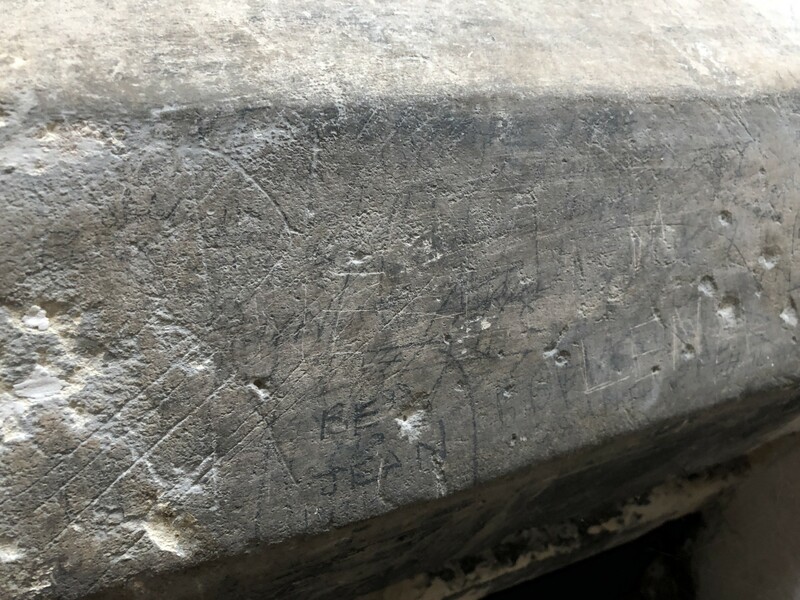 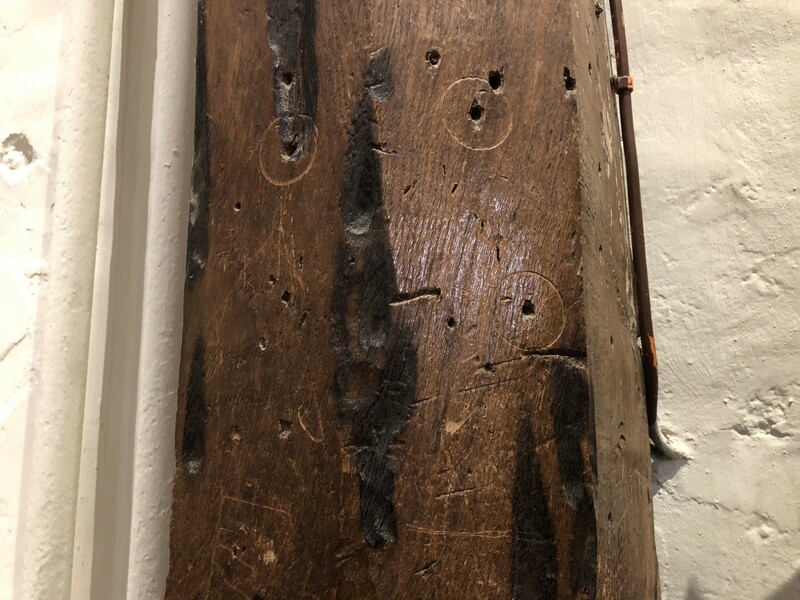 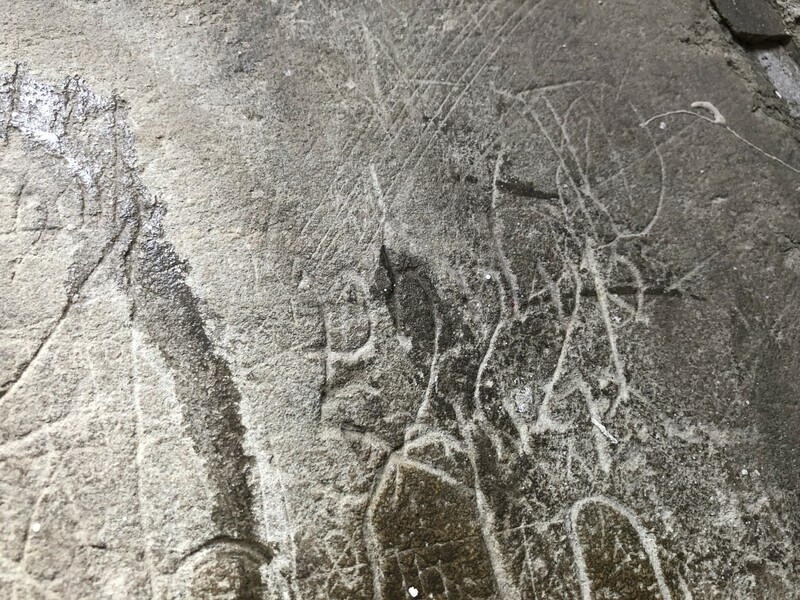 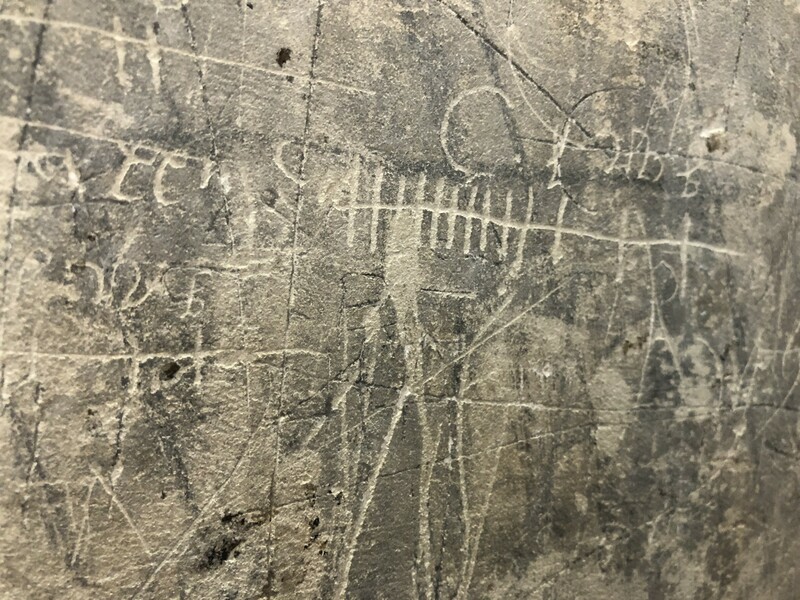 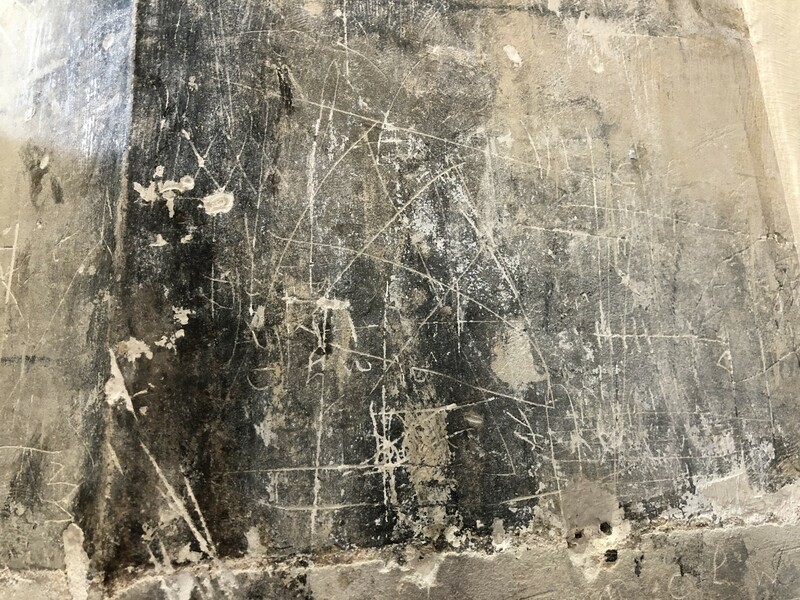 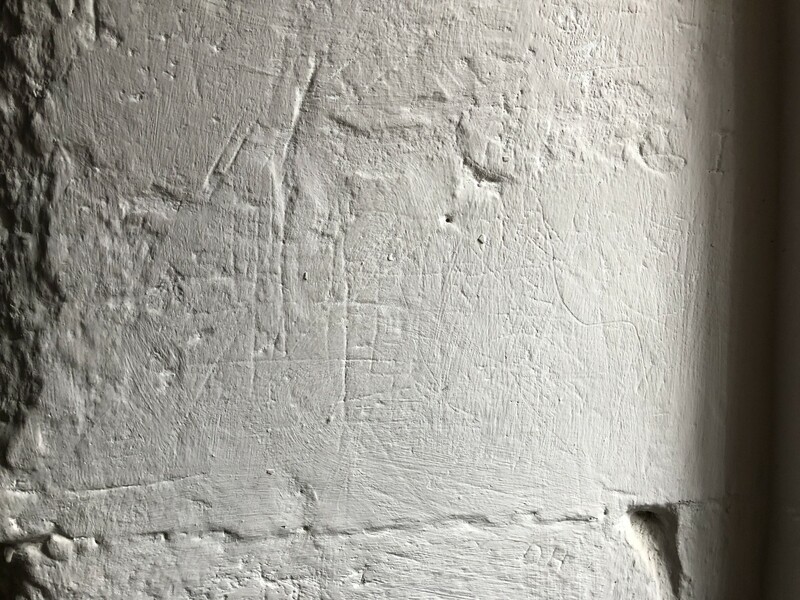 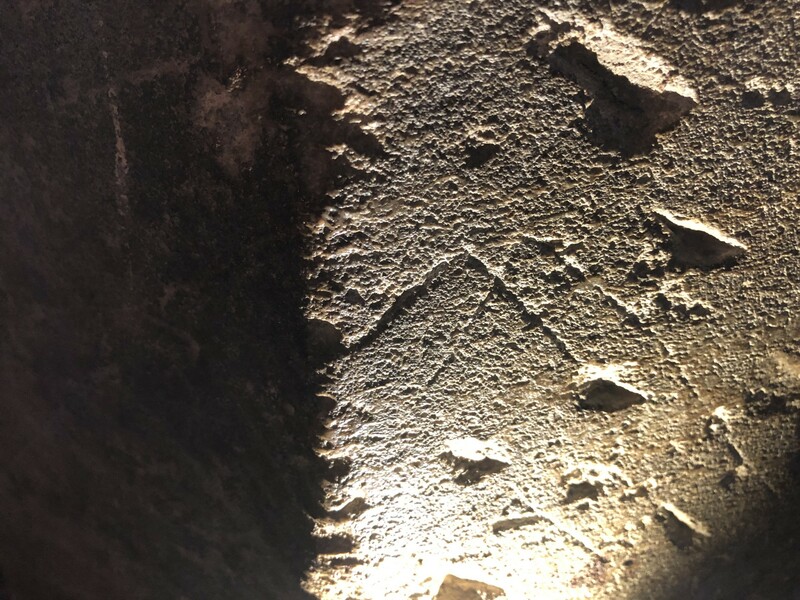 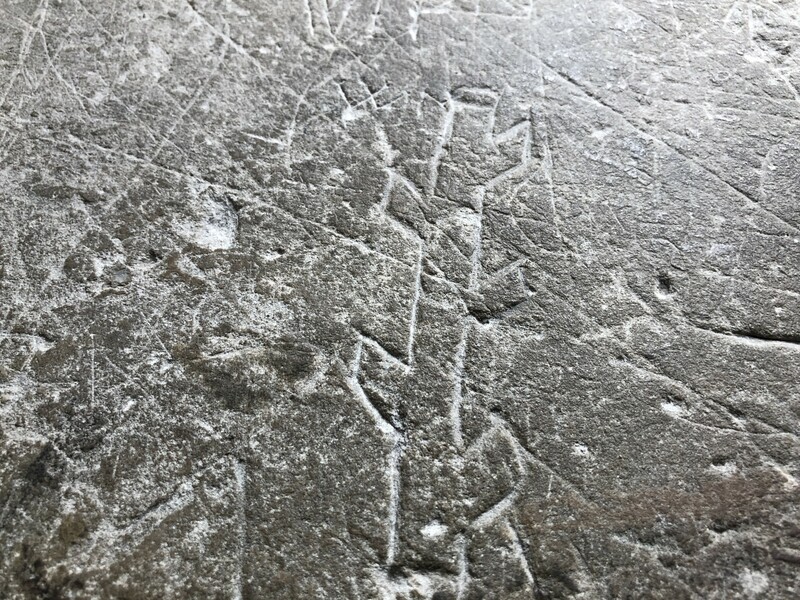 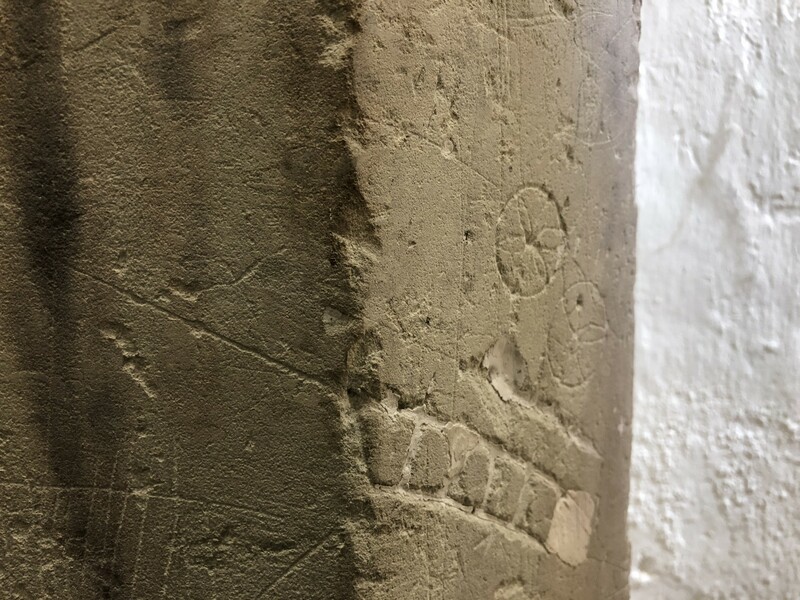 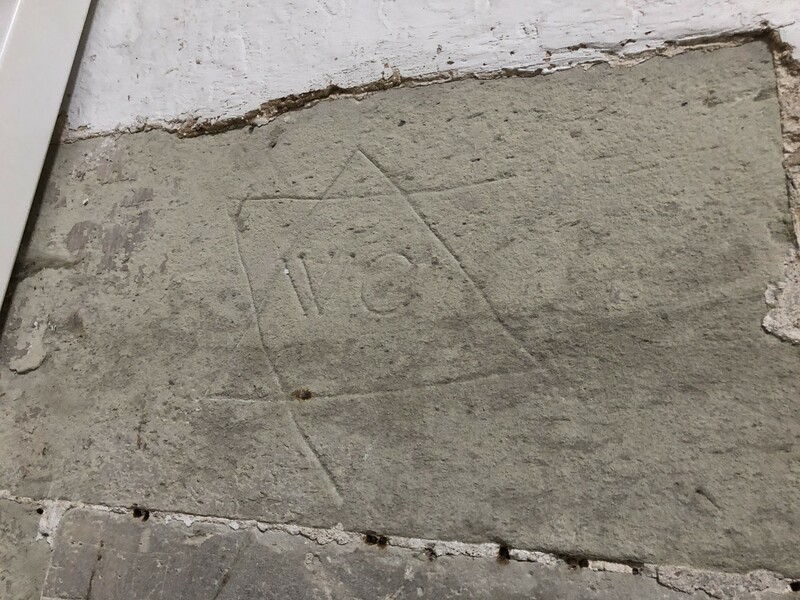 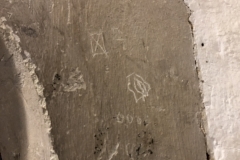 I was blown away by how much graffiti there is in the place from drawings and protective marks in the Tudor kitchens to tourist and soldiers’ graffiti in the 18th century parts. 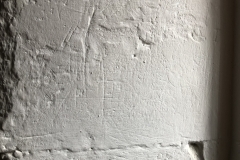 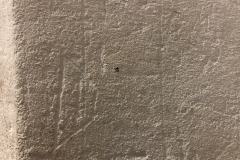 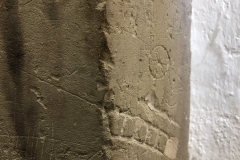 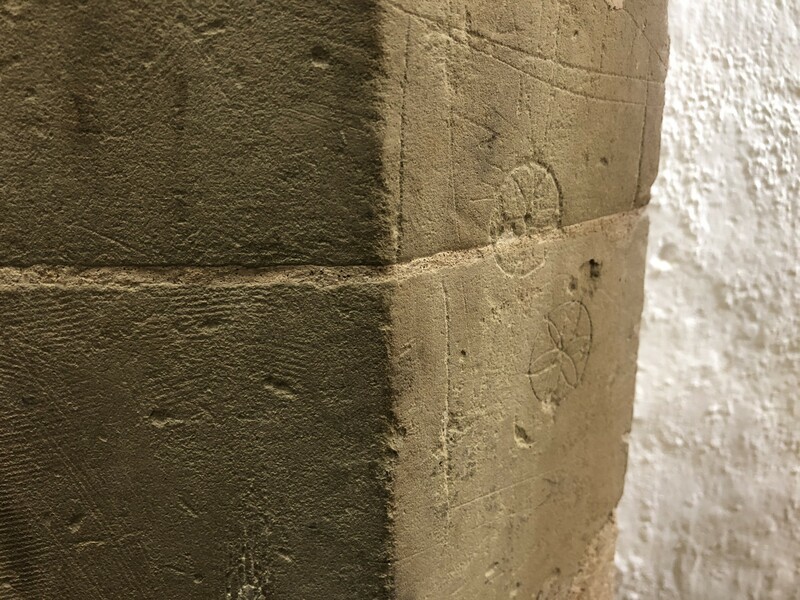 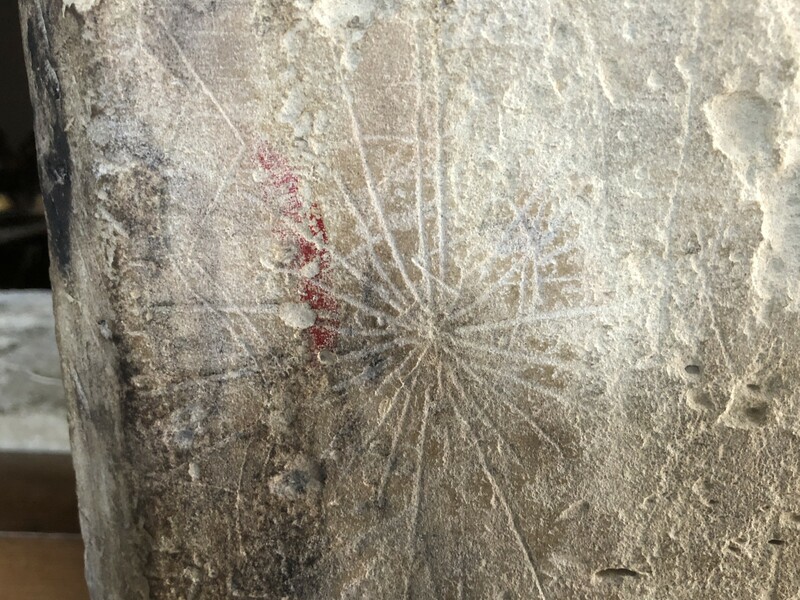 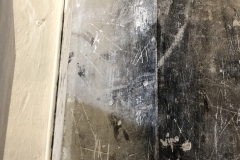 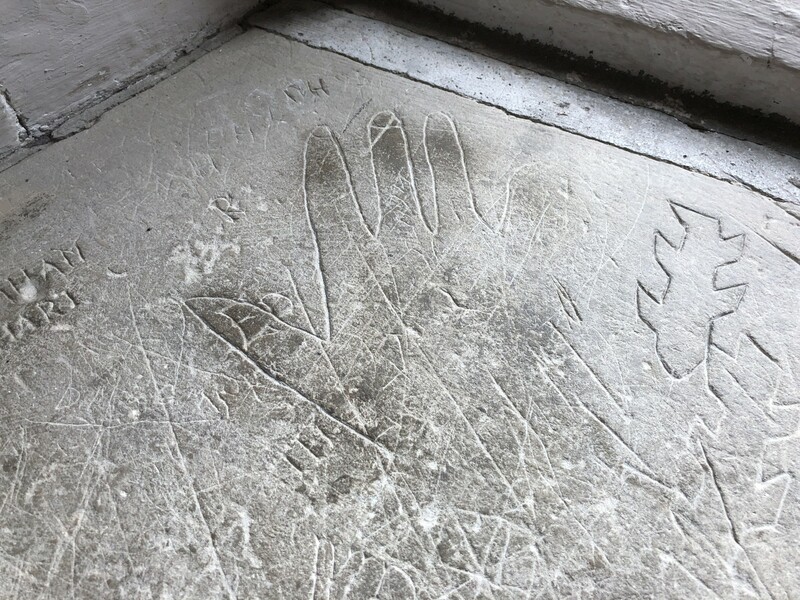 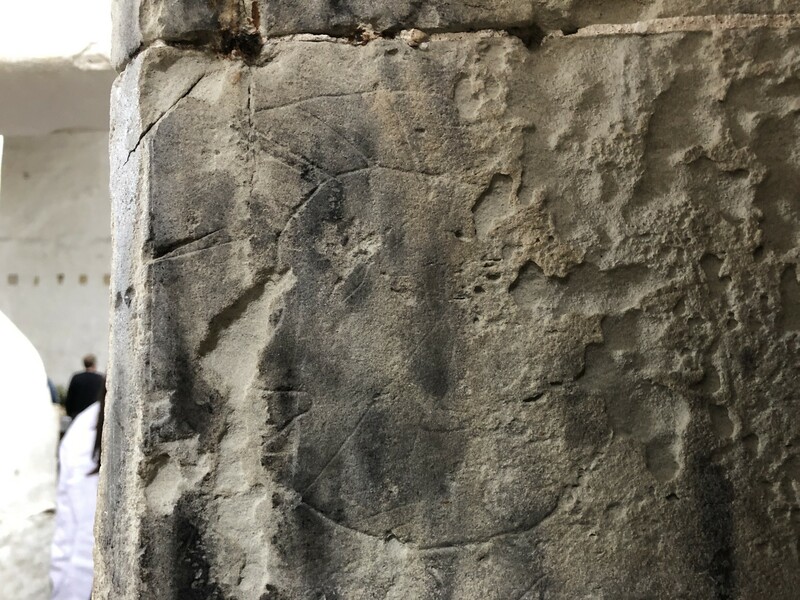 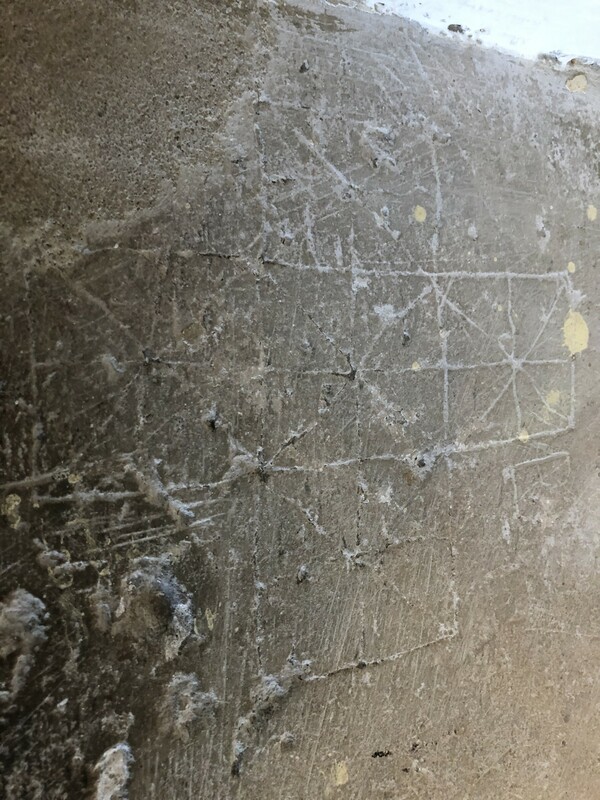 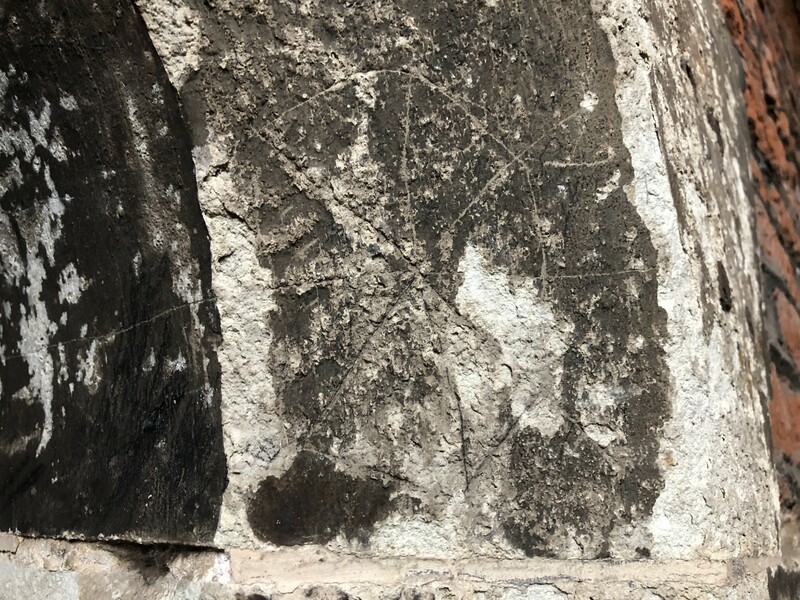 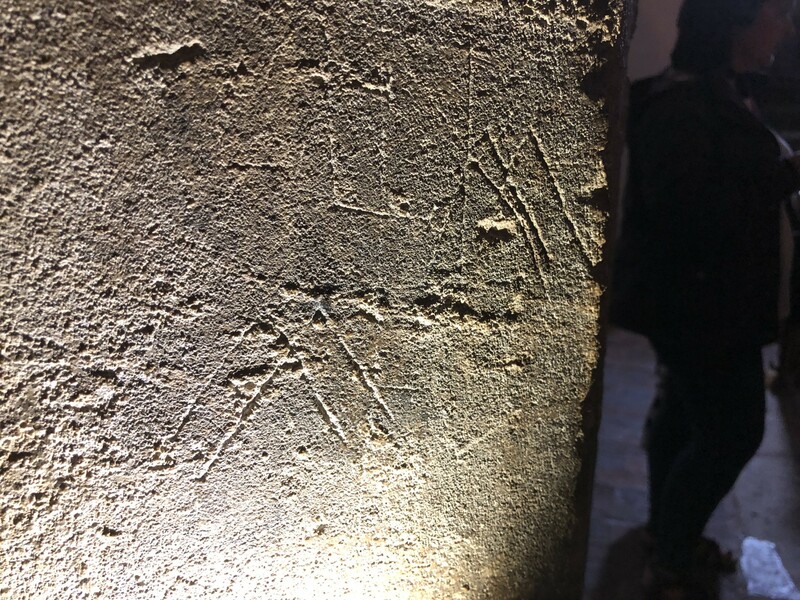 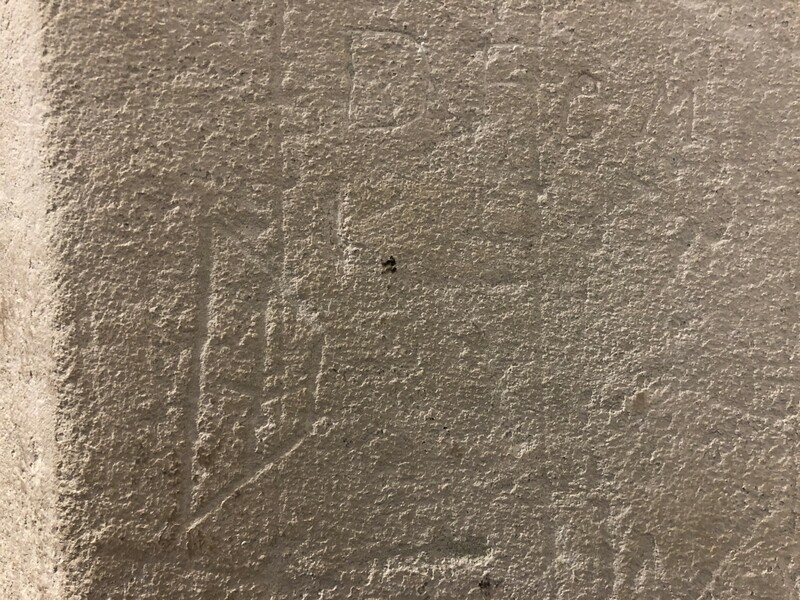 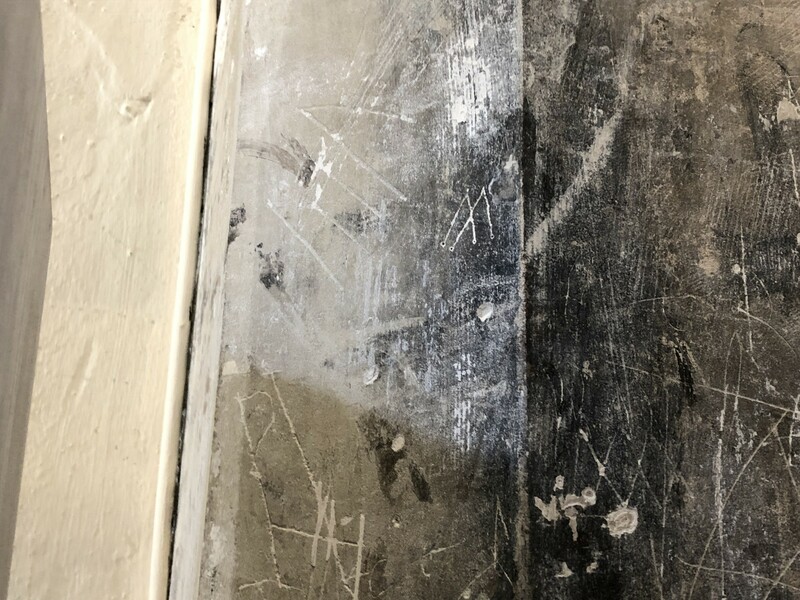 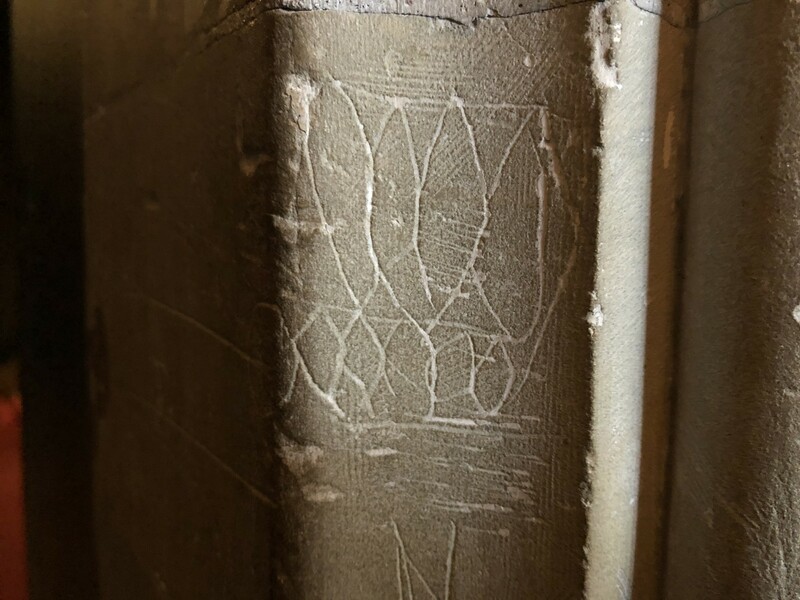 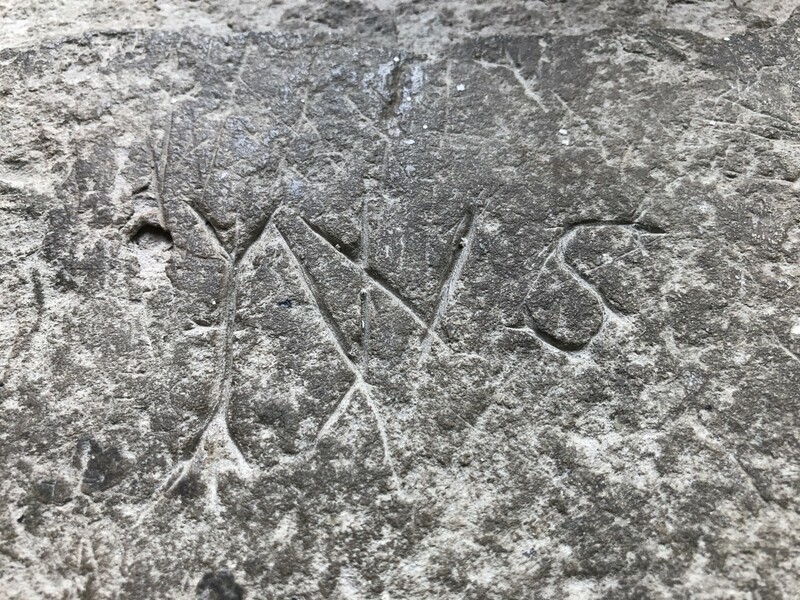 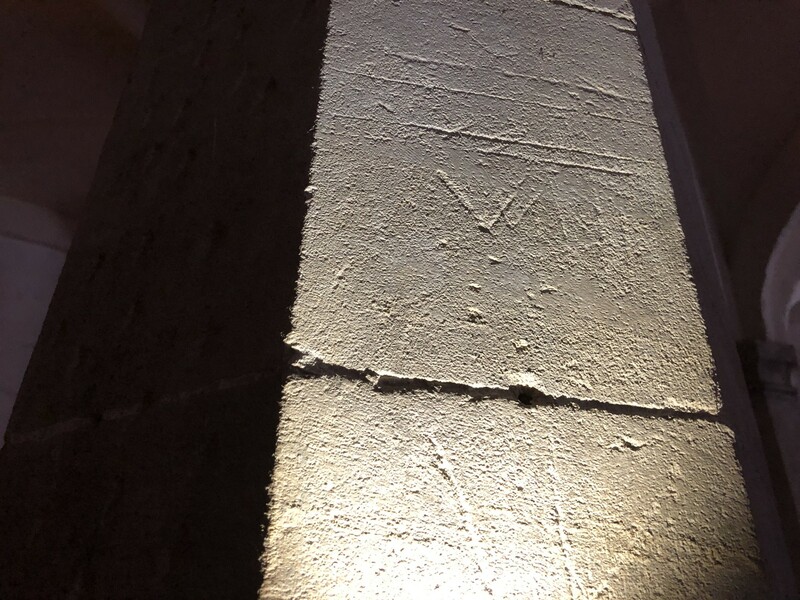 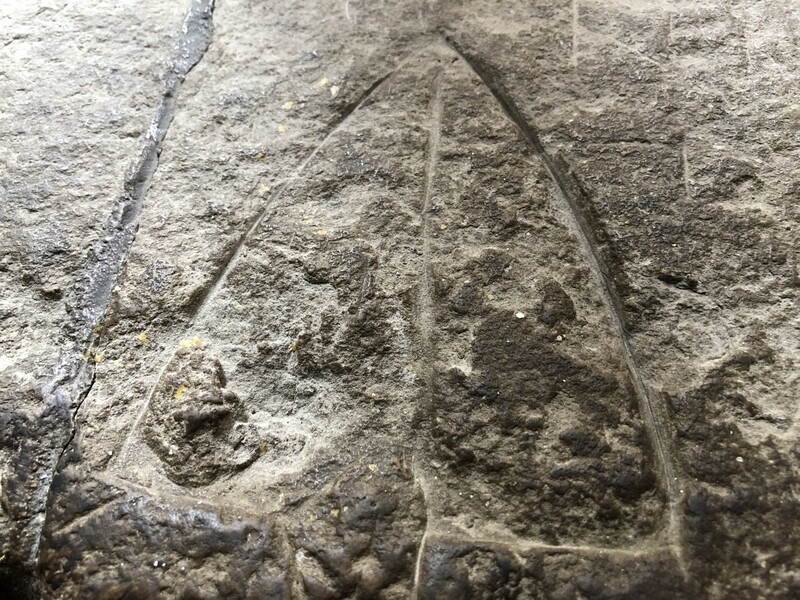 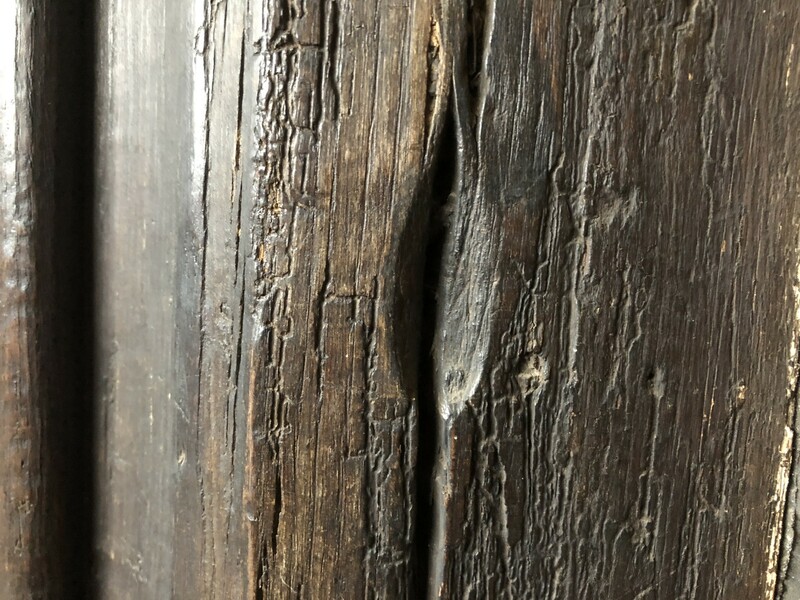 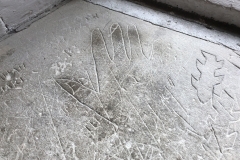 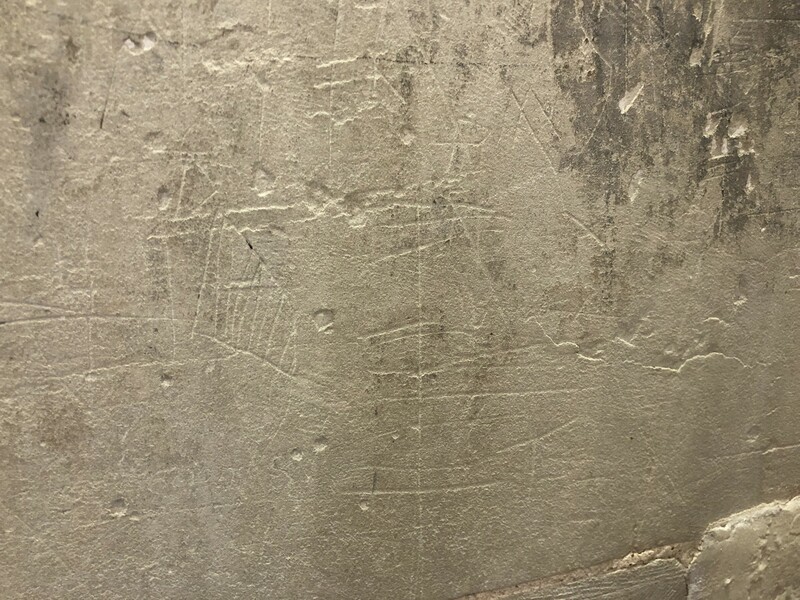 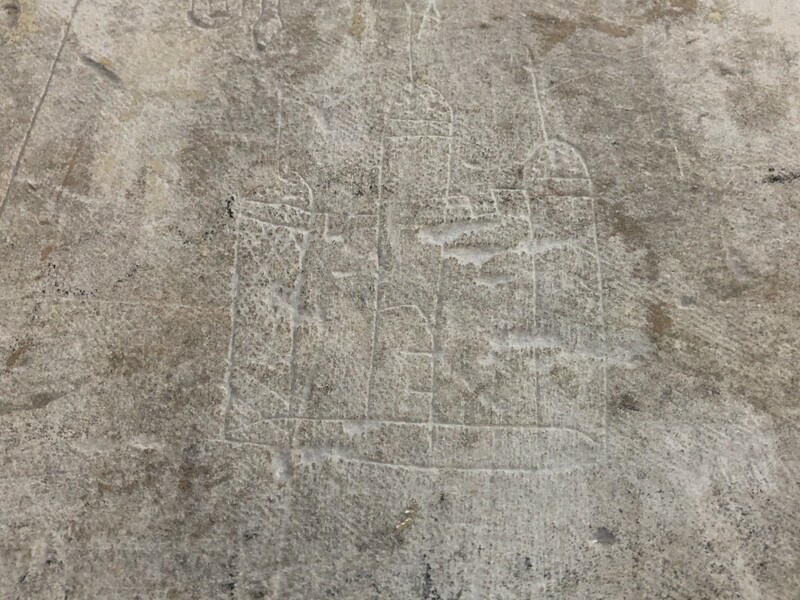 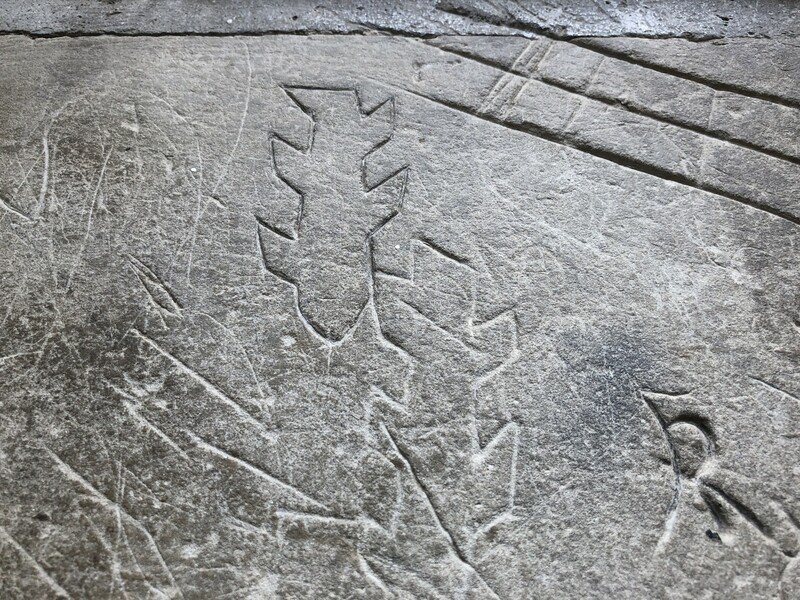 I am splitting the report on the graffiti at Hampton Court into two parts – the first deals with the graffiti in the Tudor areas and the second part will deal with the later graffiti. 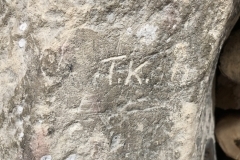 I will mostly divide the graffiti into area in the palace rather than by type or date. 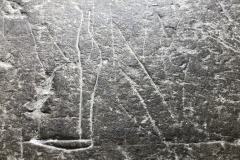 I also apologise for the quality of some of the pictures, I was without a torch and had to rely mostly on natural light. 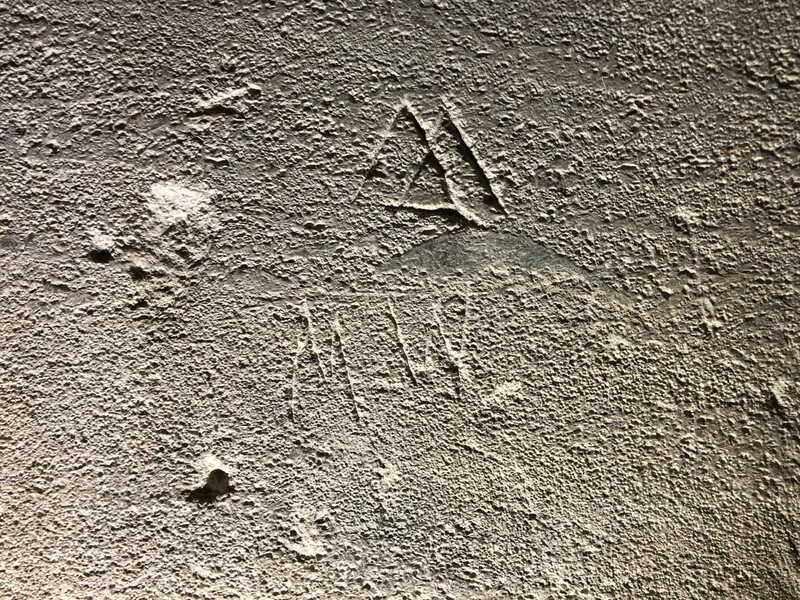 Henry VIII’s Kitchens were the first indication that this place was going to be a graffiti gold-mine. 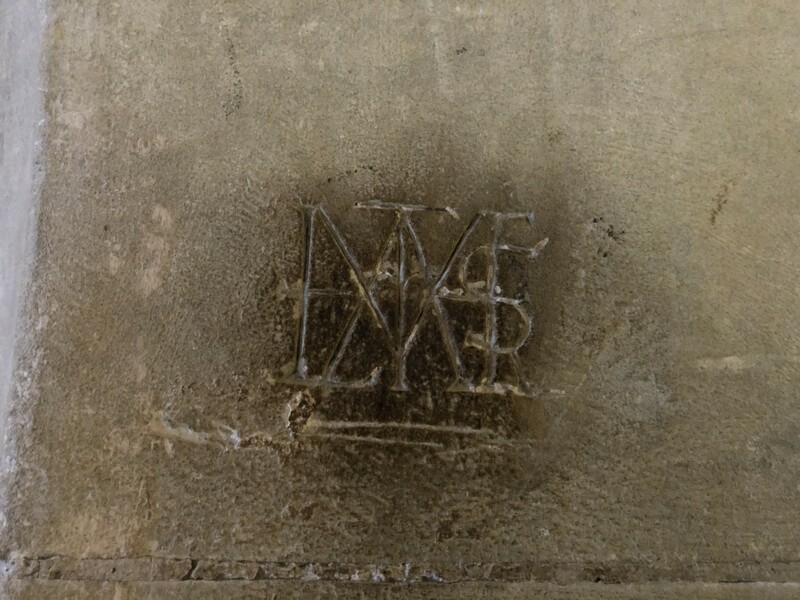 The first fireplace displayed an interlaced IHS monogram, a building and a stag. 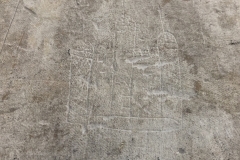 At first glance I thought the building was the Tower of London, but further investigation showed that it could be a picture of Hampton Court gatehouse as in this 16th century drawing by Anthonis van den Wyngaerde. 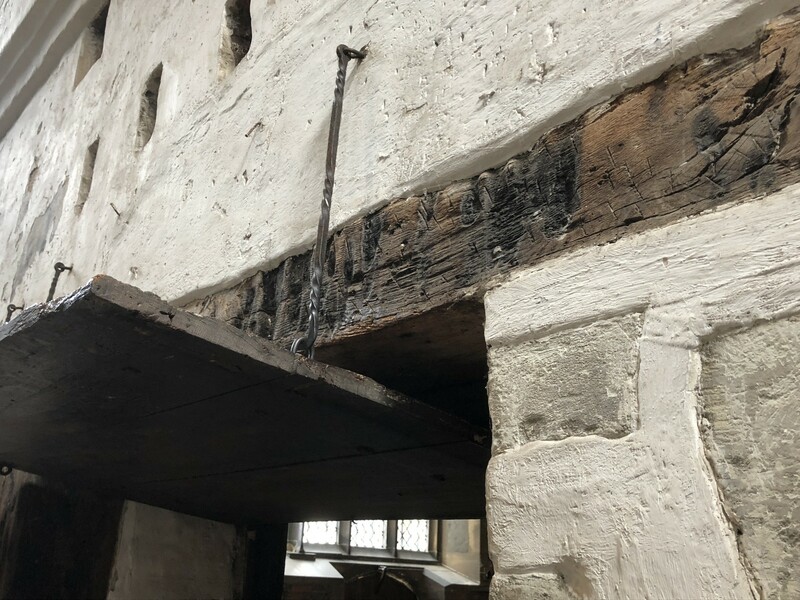 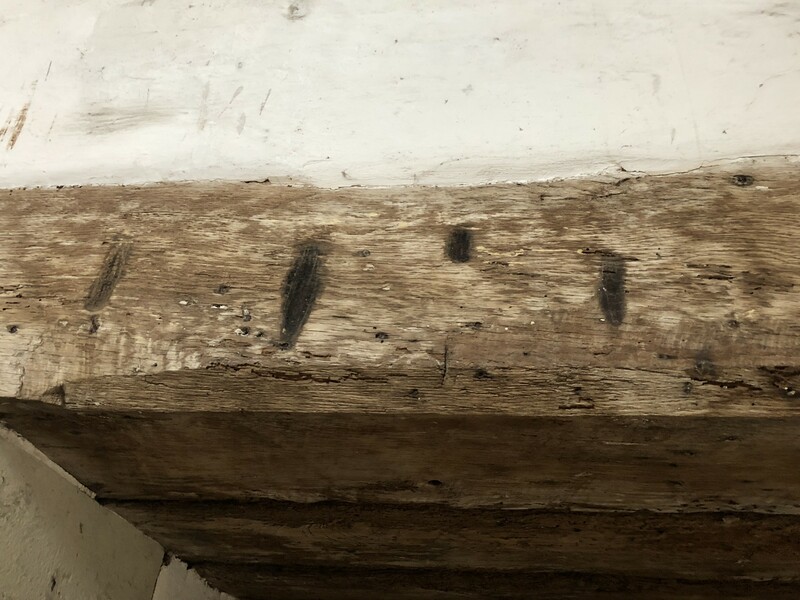 The beams of the kitchens are scarred with many protective scorch marks. 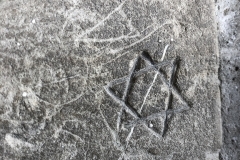 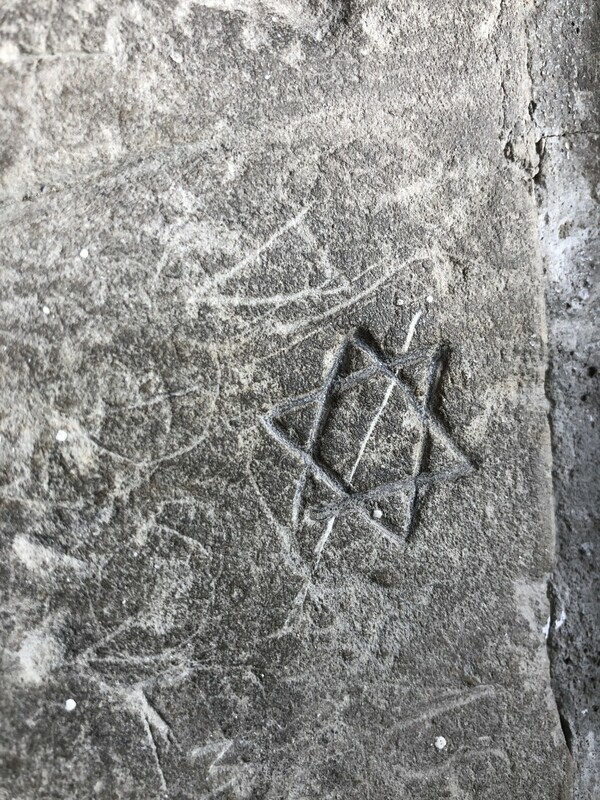 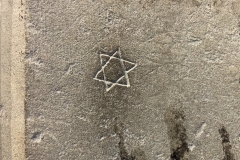 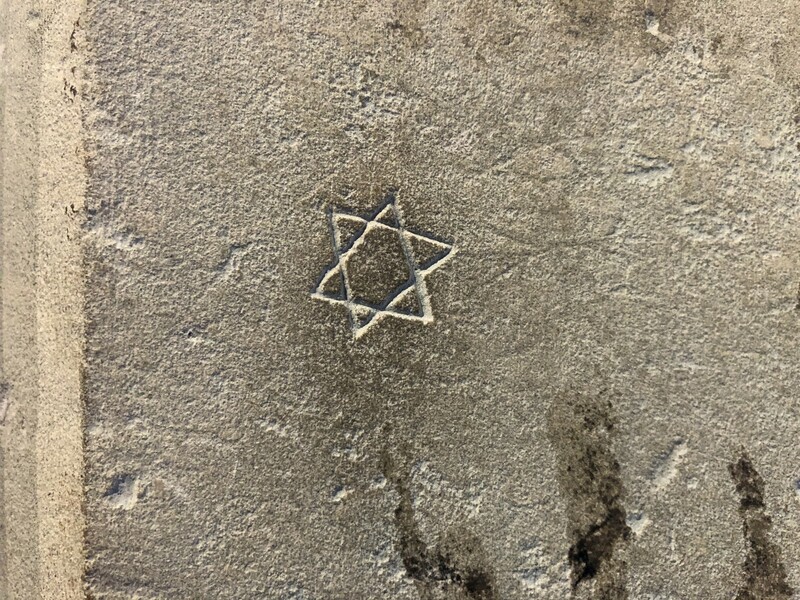 Other marks in the kitchen include a six pointed star of David, a faint figure on horseback, a bag or sack, a crown and a face. 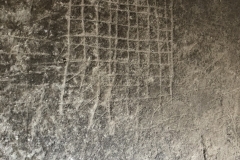 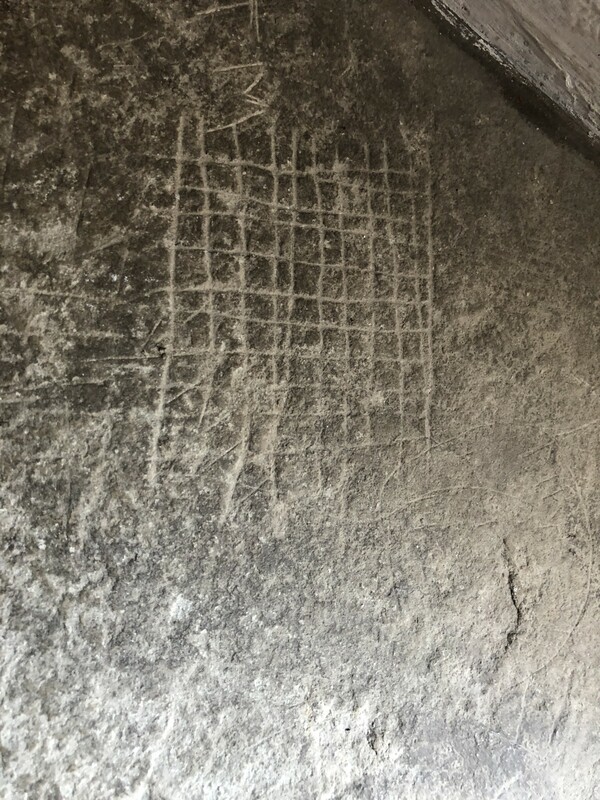 The kitchen shop had several graffiti marks in one window bay including tally marks, a ship and a cluster of compass drawn daisy wheels. 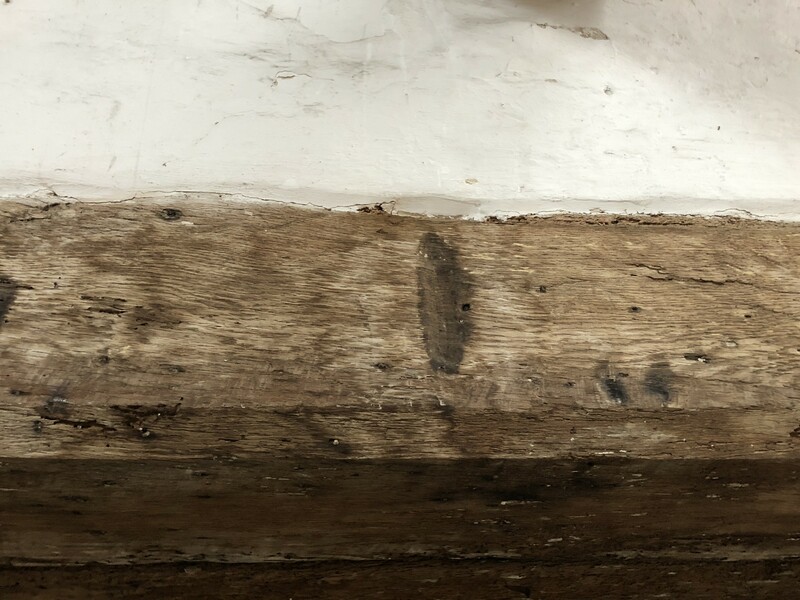 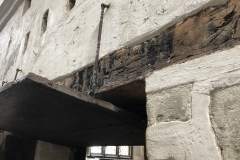 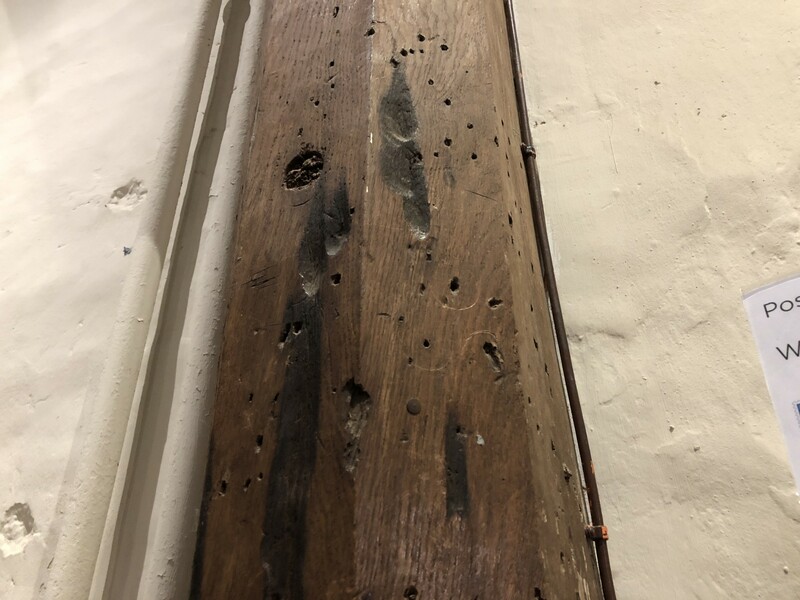 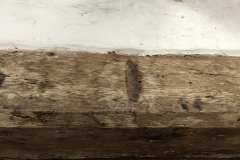 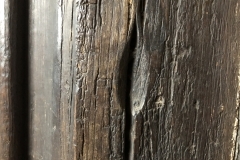 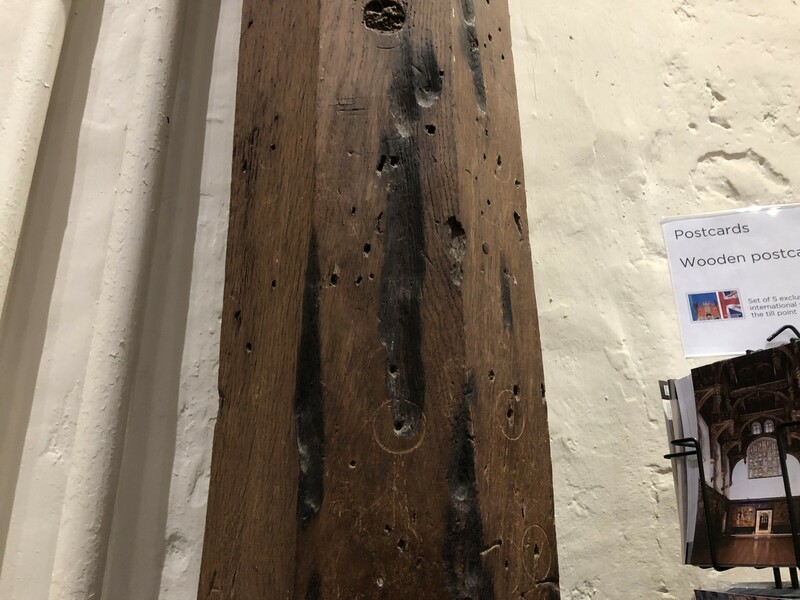 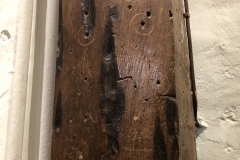 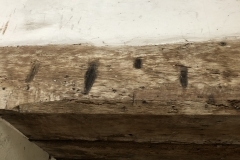 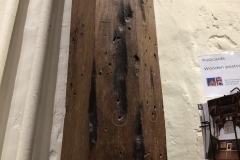 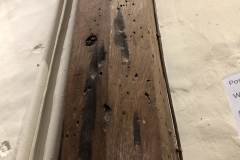 The beams and wooden posts in the shop were also well-protected by scorch marks. 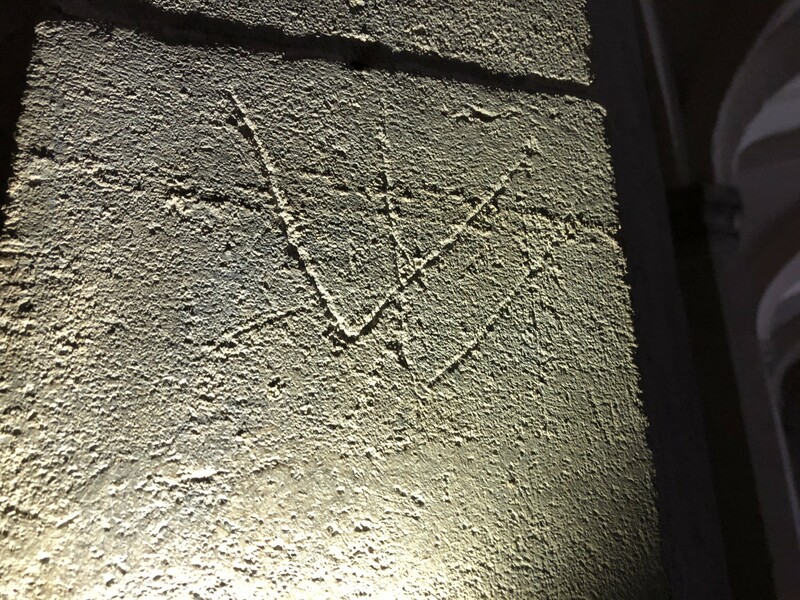 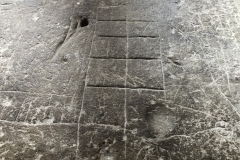 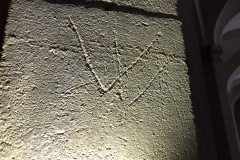 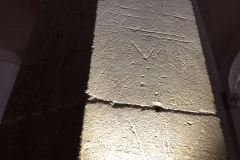 The most concentrated set of Marian marks were on the columns nearests the entrances to Henry VIIIs Wine Cellar. 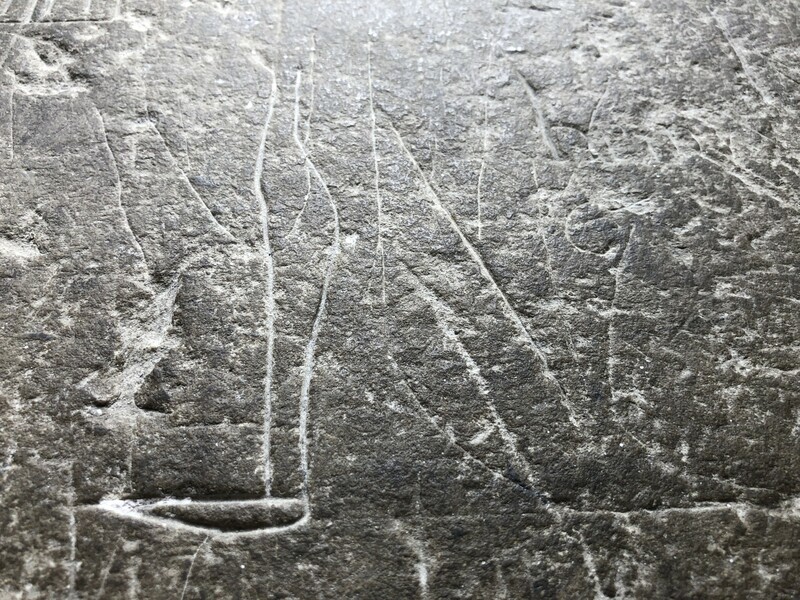 Clearly they were taking no chances with the royal booze! 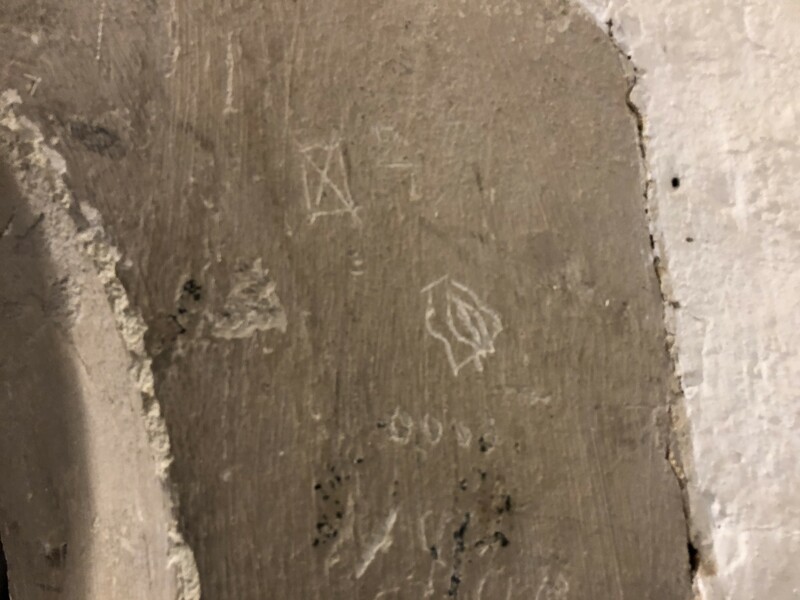 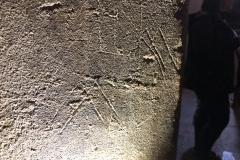 The other tudor rooms have a scattering of graffiti, some of which is acknowledged by the palace guide and interpretation although most is not. 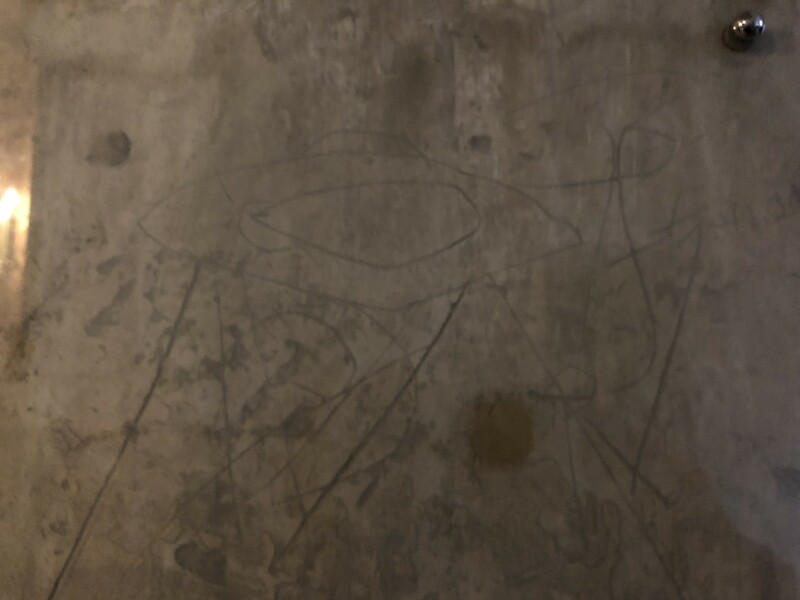 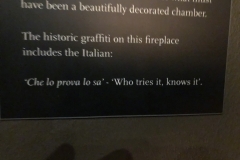 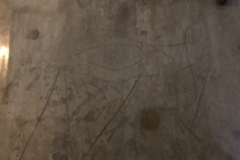 The most prominent of the acknowledged graffiti is above a fireplace. 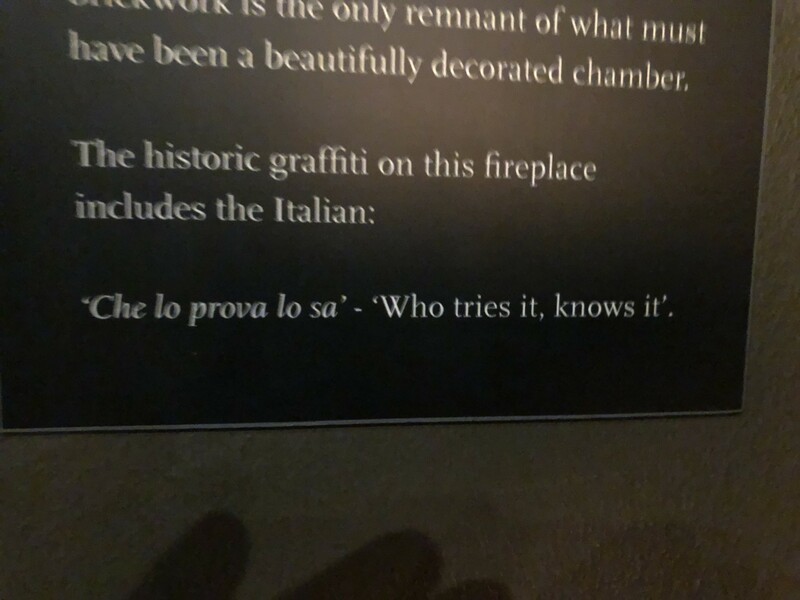 The Italian phrase ‘Chi lo prova lo sa’ (Who tries it, knows it) is clearly visible (and protected behind perspex). 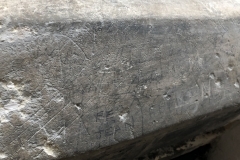 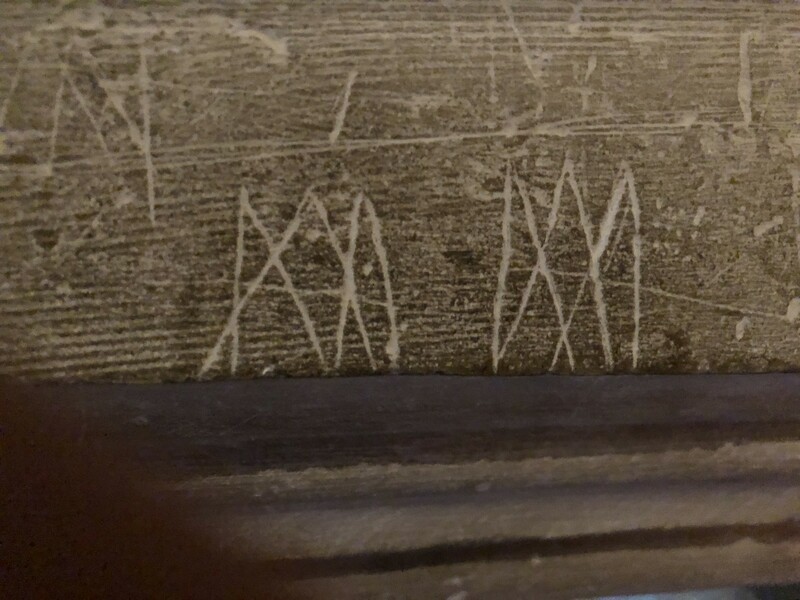 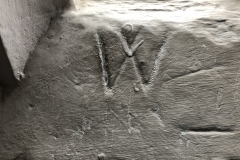 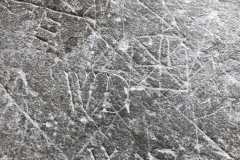 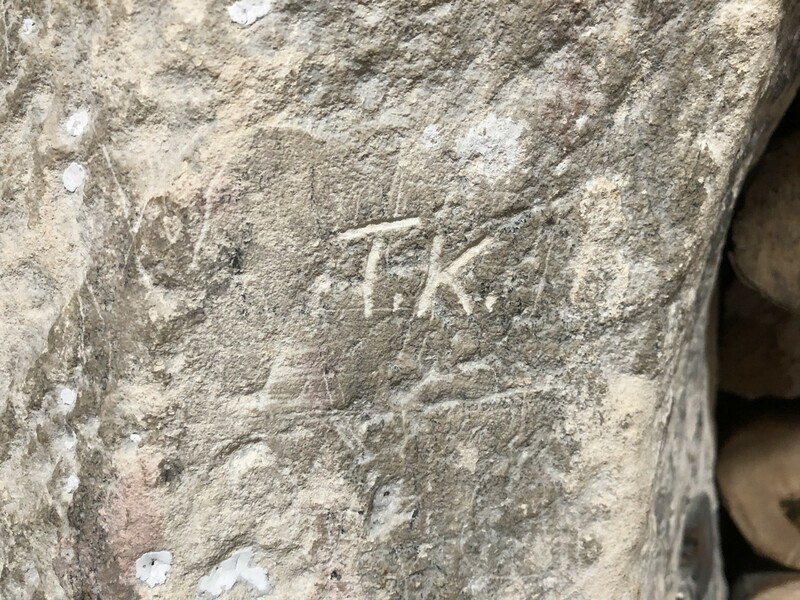 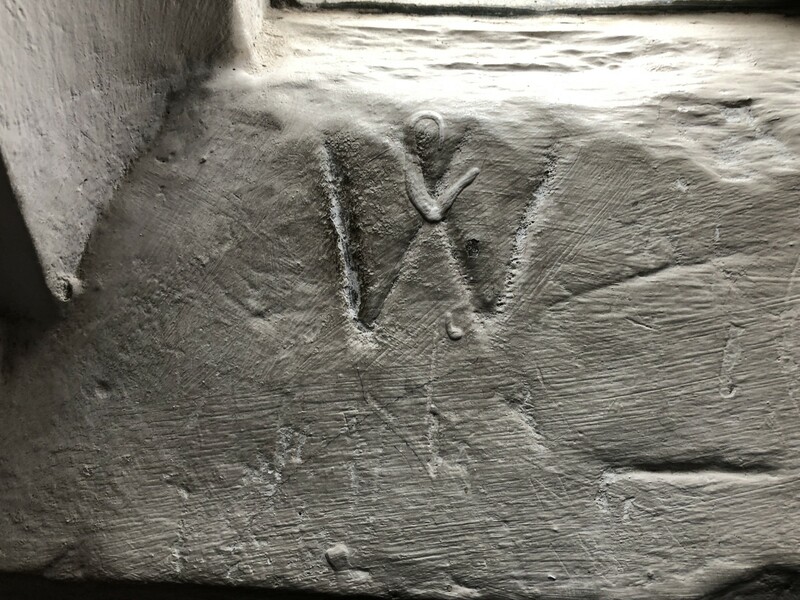 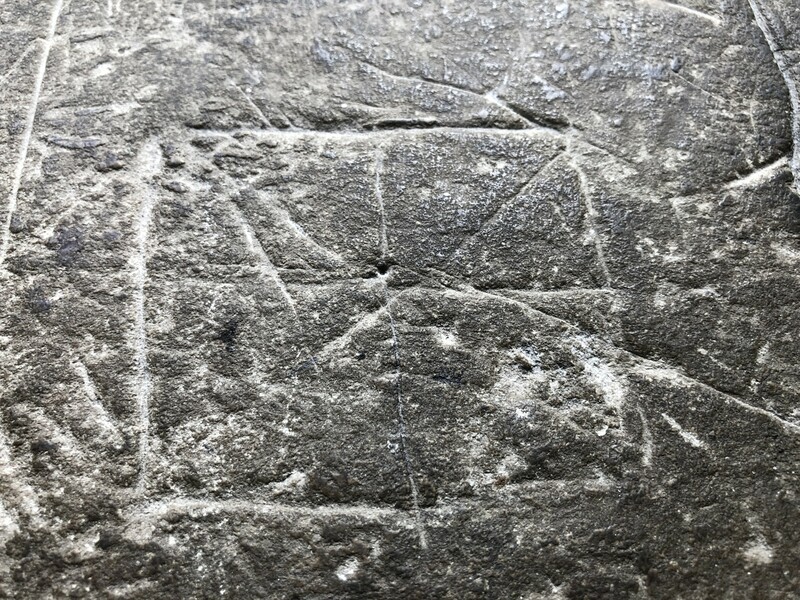 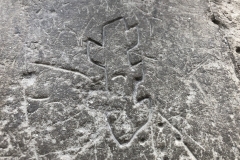 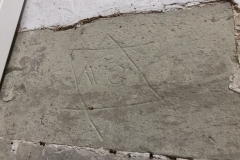 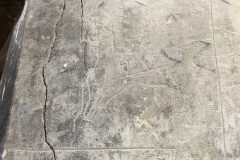 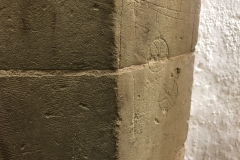 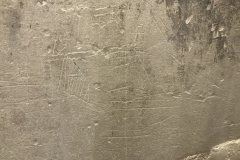 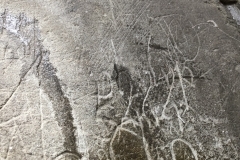 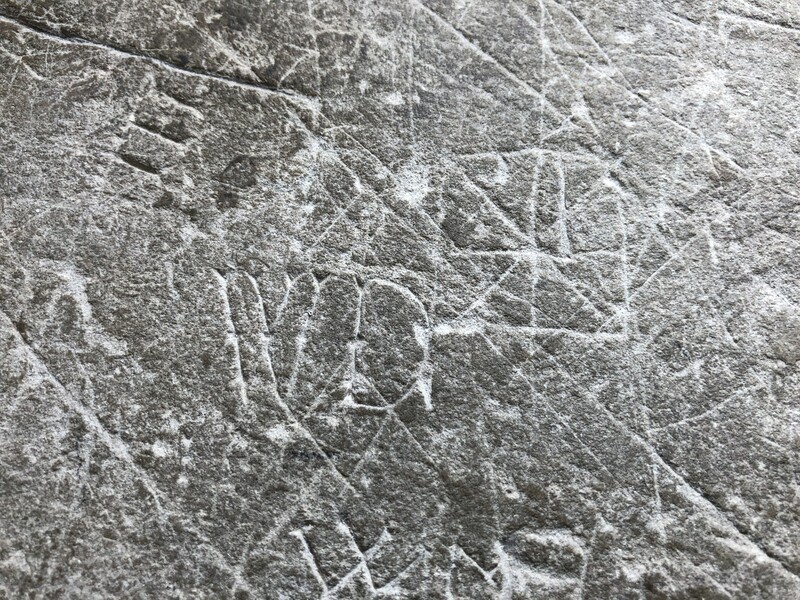 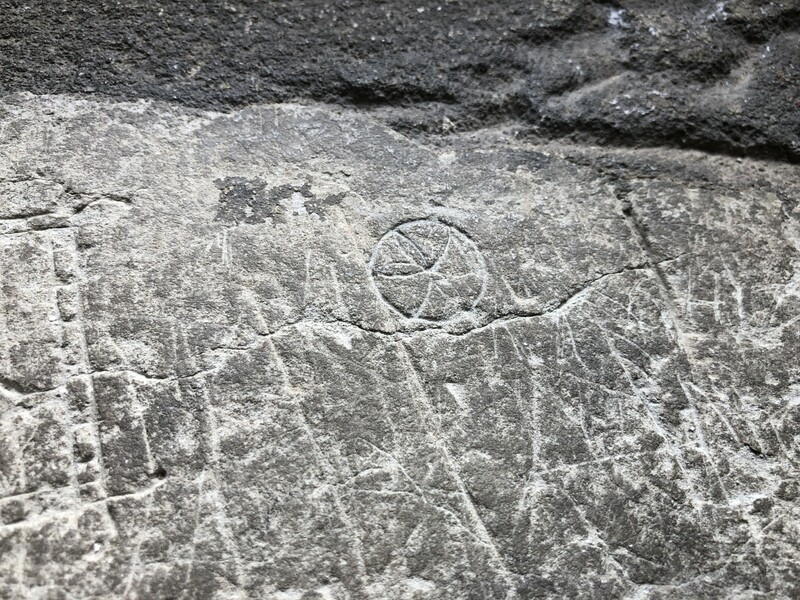 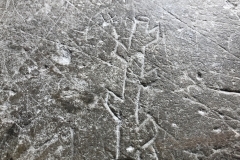 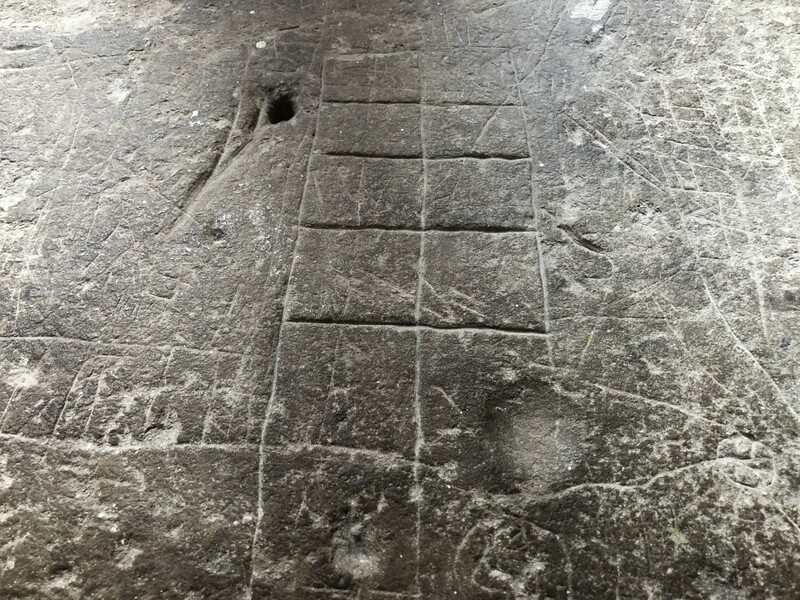 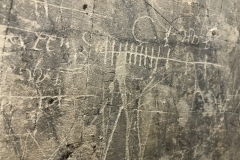 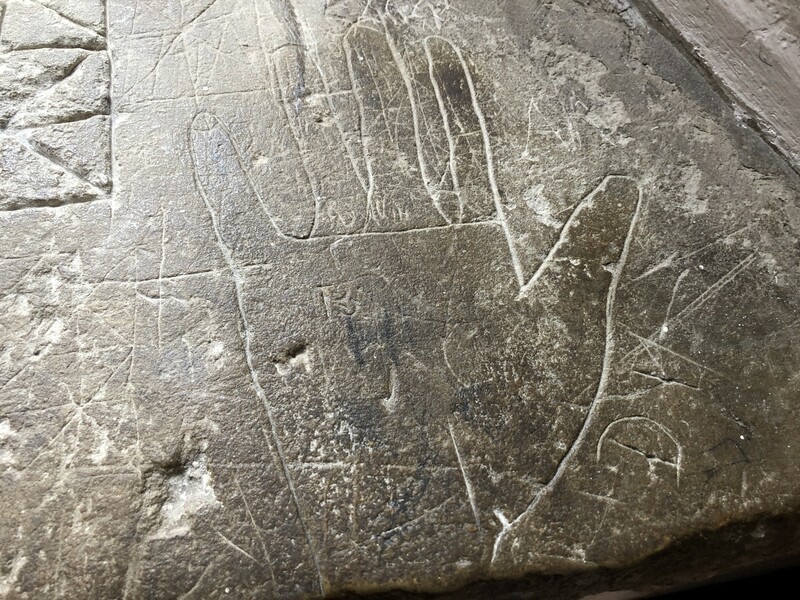 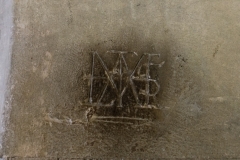 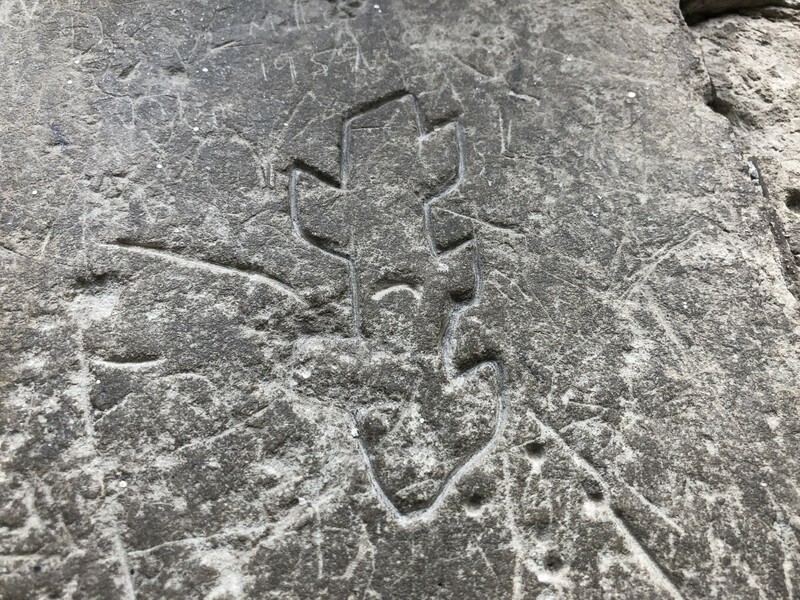 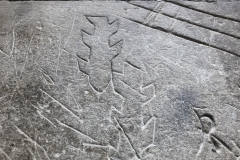 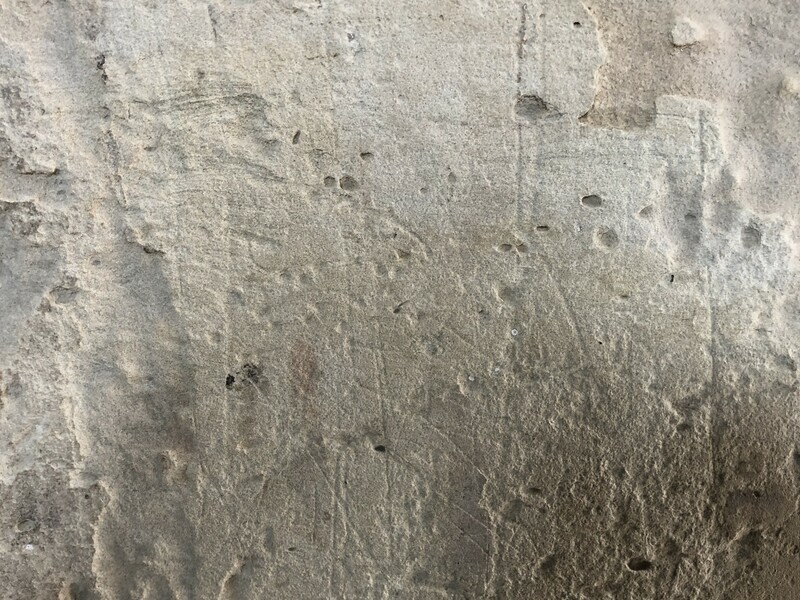 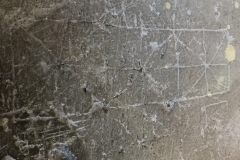 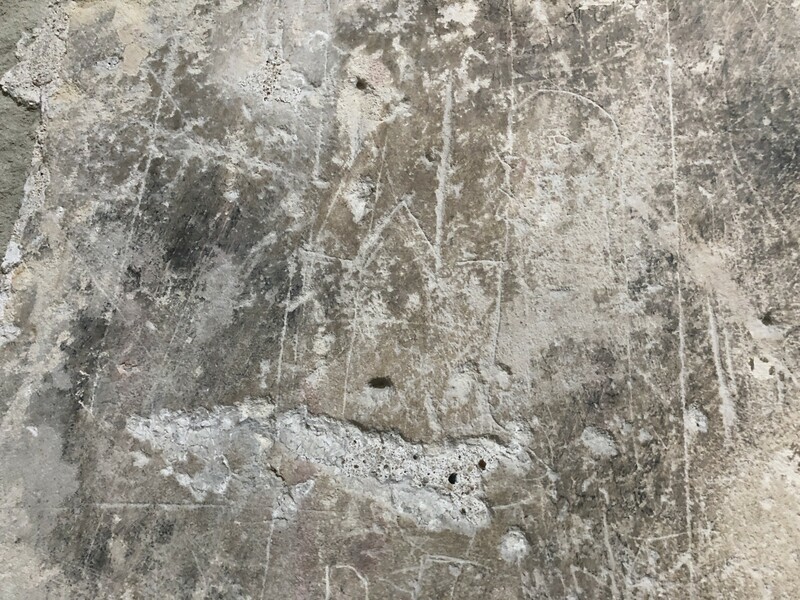 This appears to be an example of domestic graffiti as described in Juliet Fleming’s book Graffiti and The Writing Arts of Early Modern England (London, 2001). 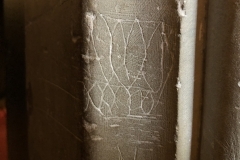 In her section on graffiti she explains how Tudor and Elizabethan homes were decorated with poems, biblical texts and epigrams. 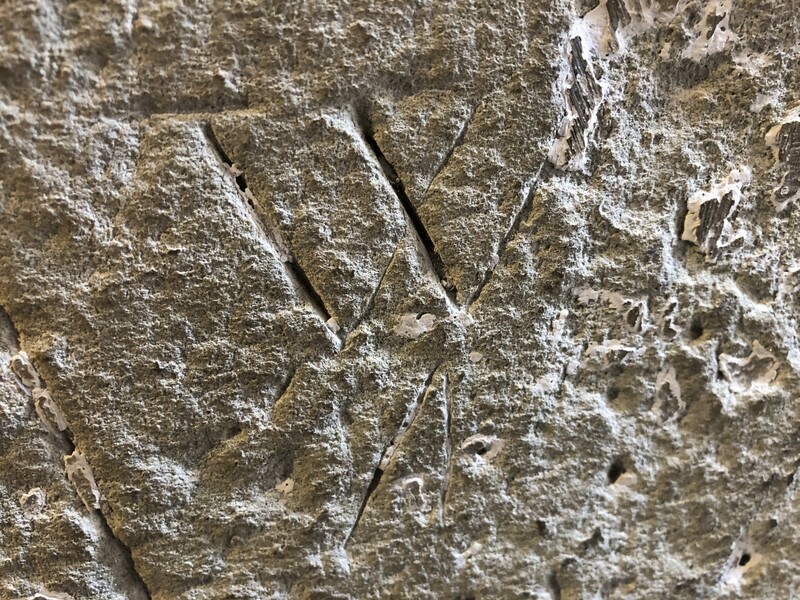 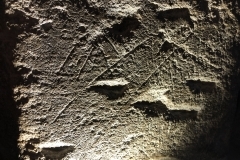 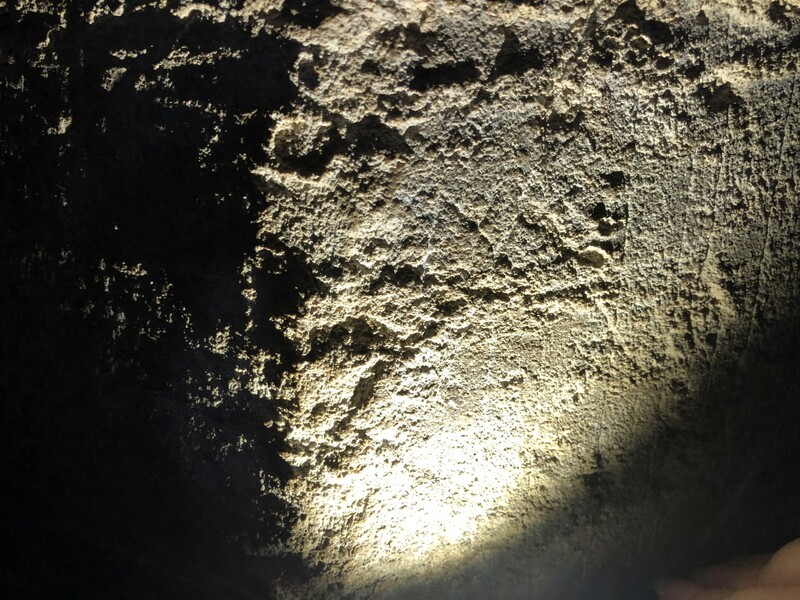 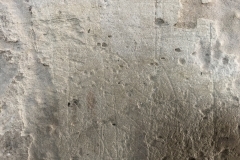 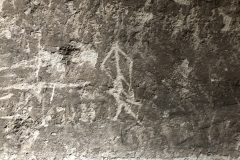 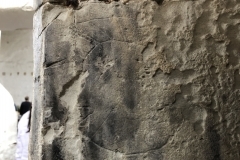 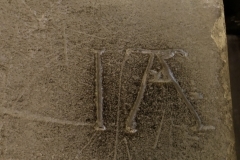 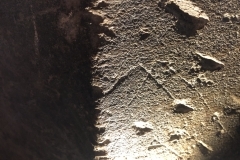 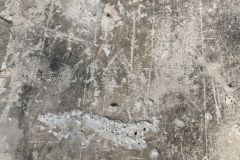 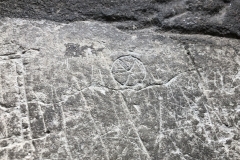 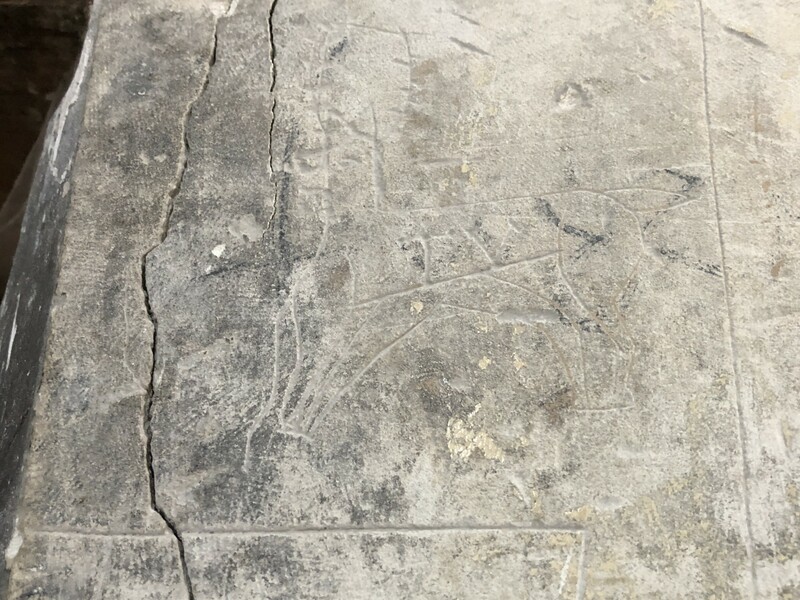 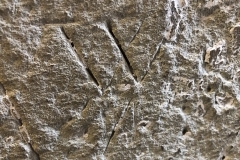 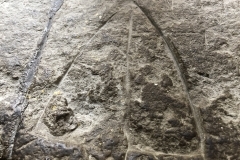 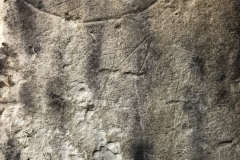 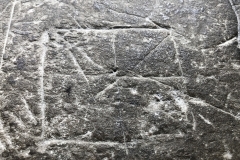 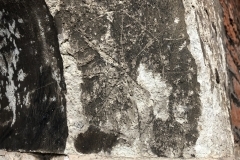 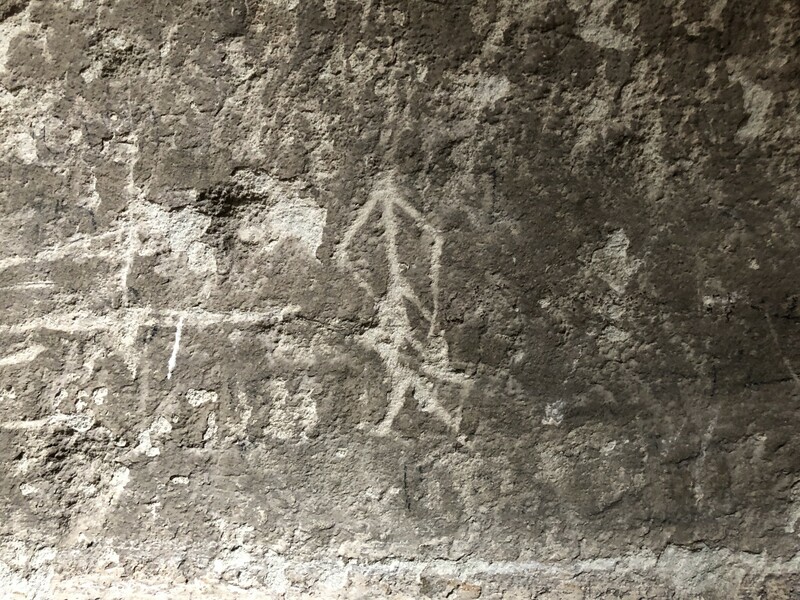 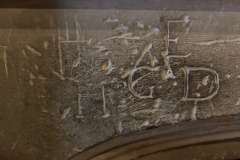 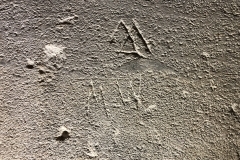 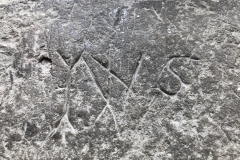 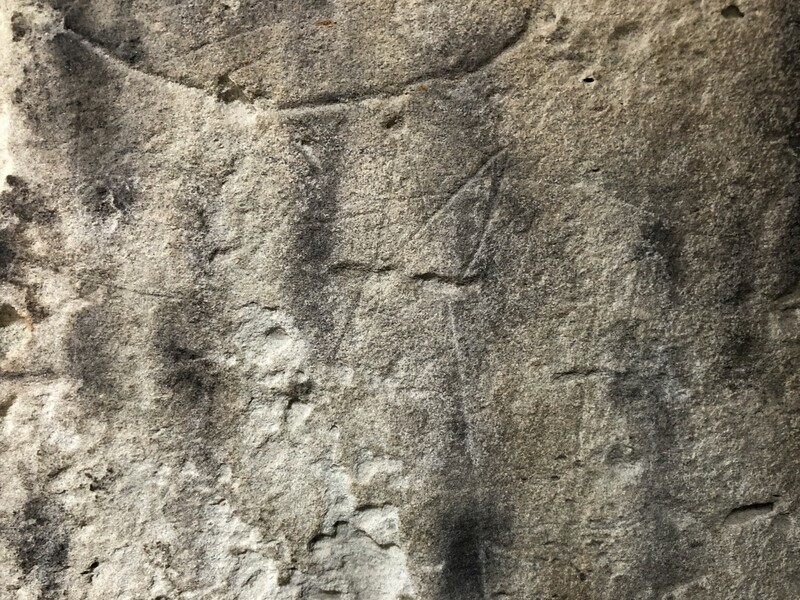 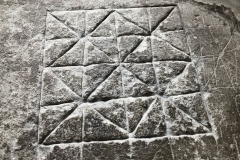 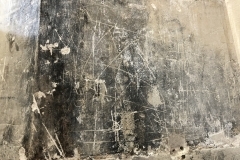 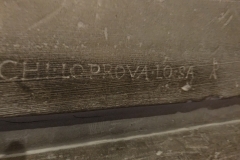 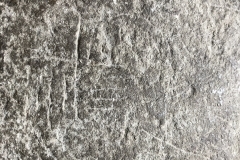 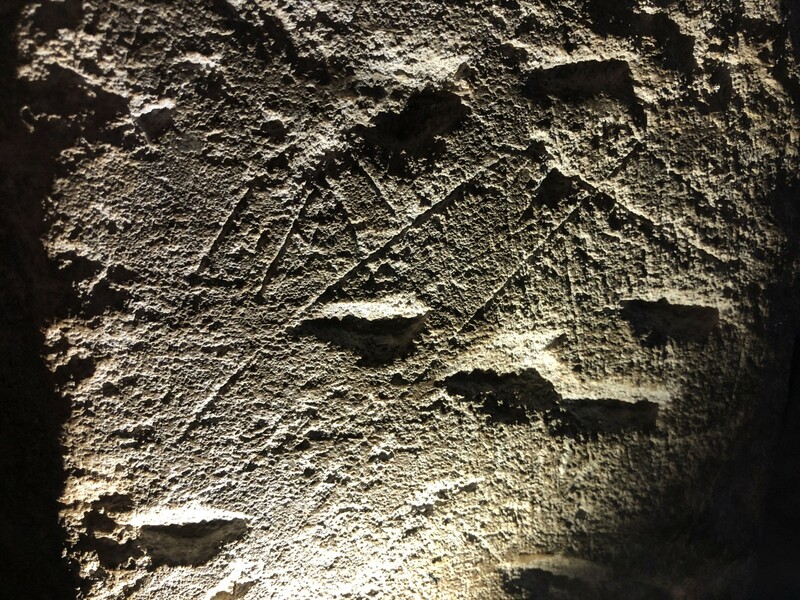 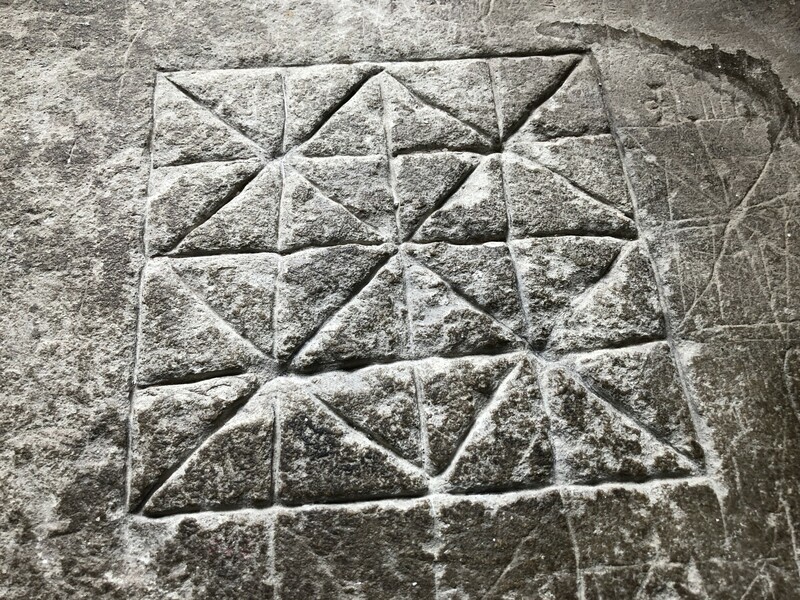 These would be printed or written on paper and pinned to the walls, some where written directly on the walls and some, like this example, were carved into the stonework. 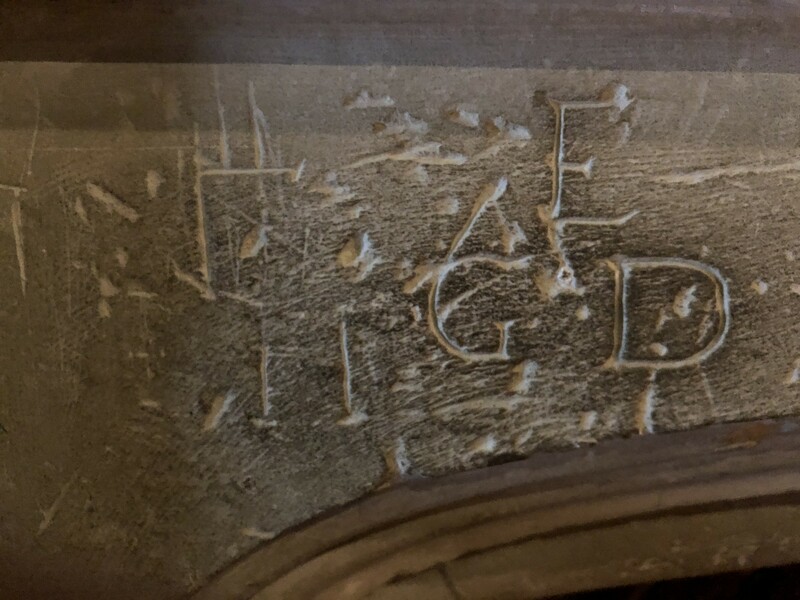 Fleming quotes G Puttenham’s The Art of English Poesie from 1589 where he notes that epigrams are ‘… but an inscription on writing made as it were upon a table, or in a window, or upon the wall or mantell of a chimney in some place of common resort…’. 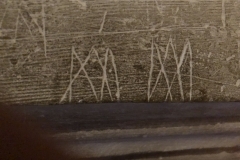 This clearly is one of the surviving writing upon a mantell. 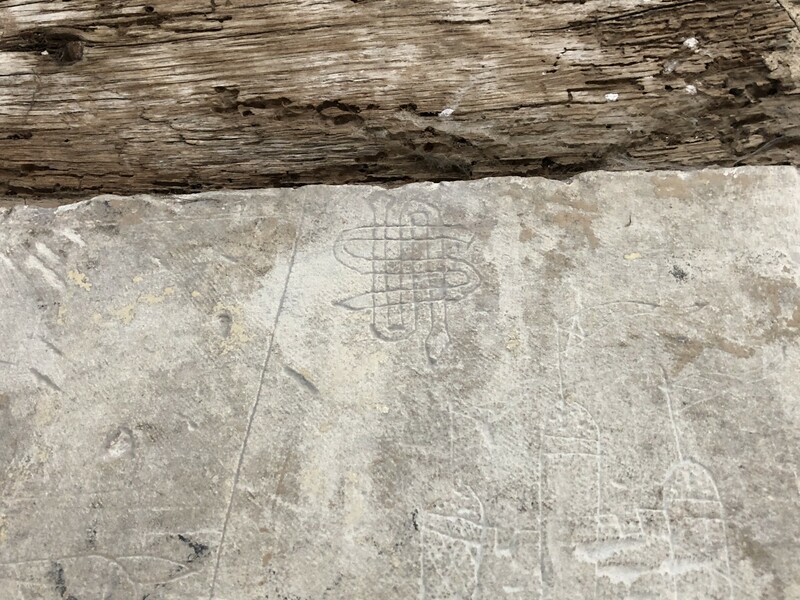 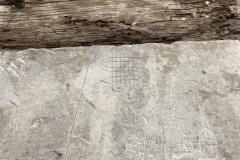 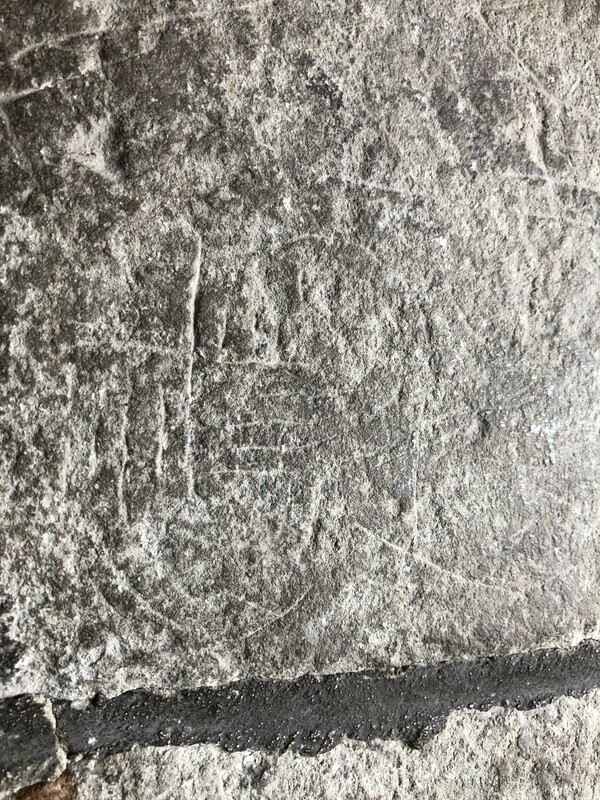 The rest of the tudor graffiti I found was on the windowsills in the processional way. 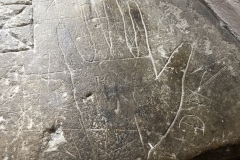 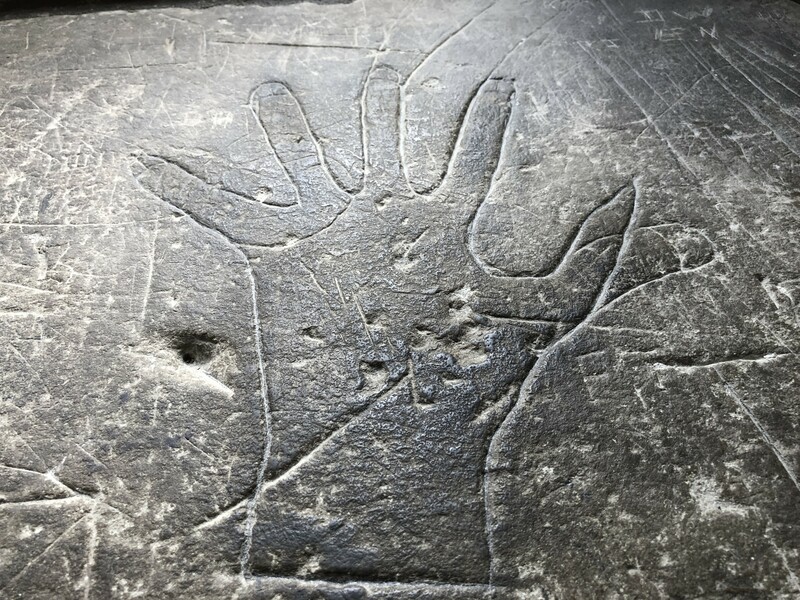 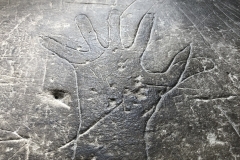 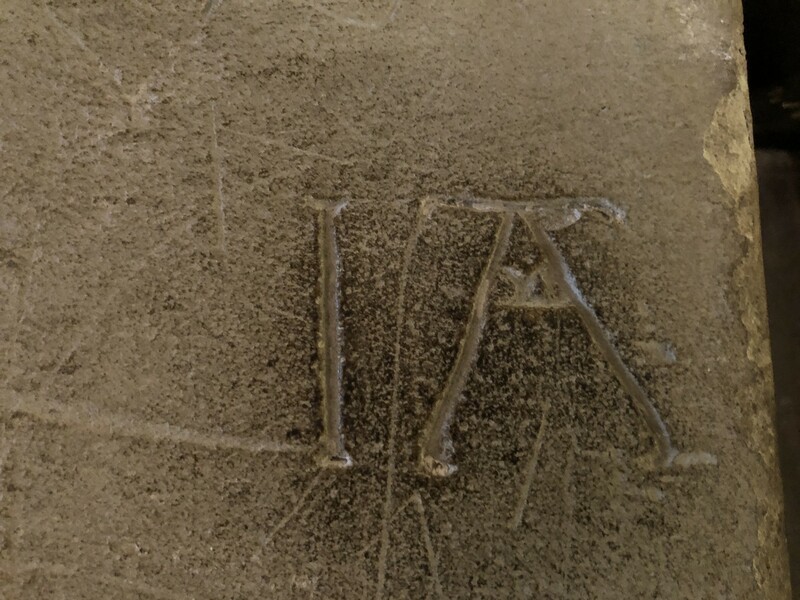 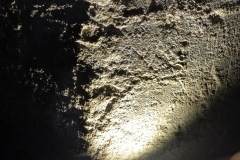 Merels, hand prints, ragged staffs and initials are prominent and deeply incised.